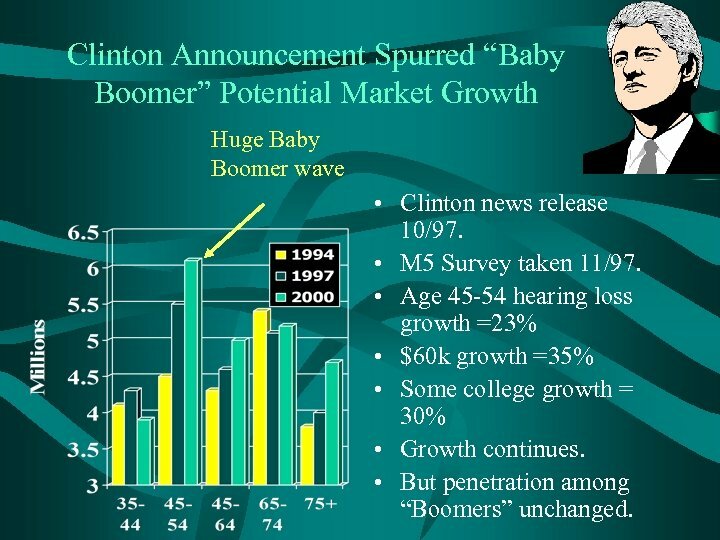 Clinton Announcement Spurred “Baby Boomer” Potential Market Growth Huge Baby Boomer wave • Clinton news release 10/97. • M 5 Survey taken 11/97. 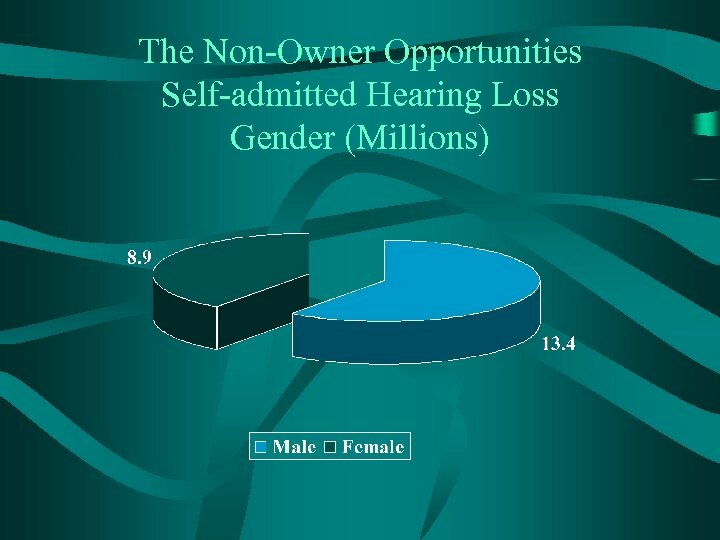 • Age 45 -54 hearing loss growth =23% • $60 k growth =35% • Some college growth = 30% • Growth continues. 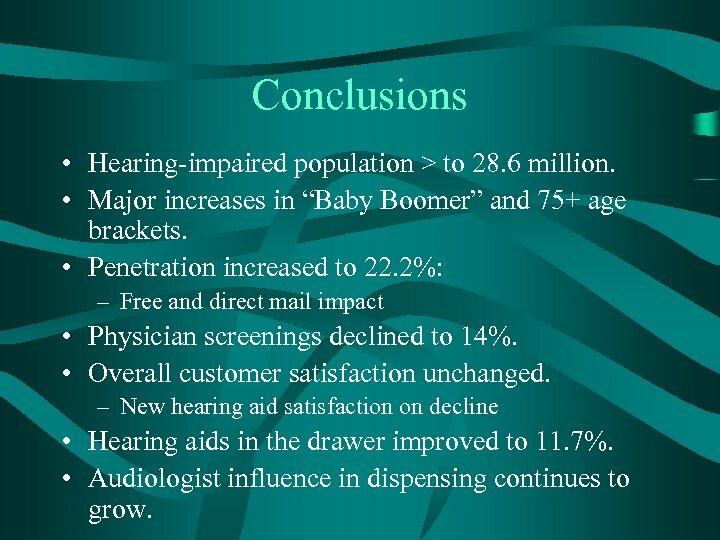 • But penetration among “Boomers” unchanged. 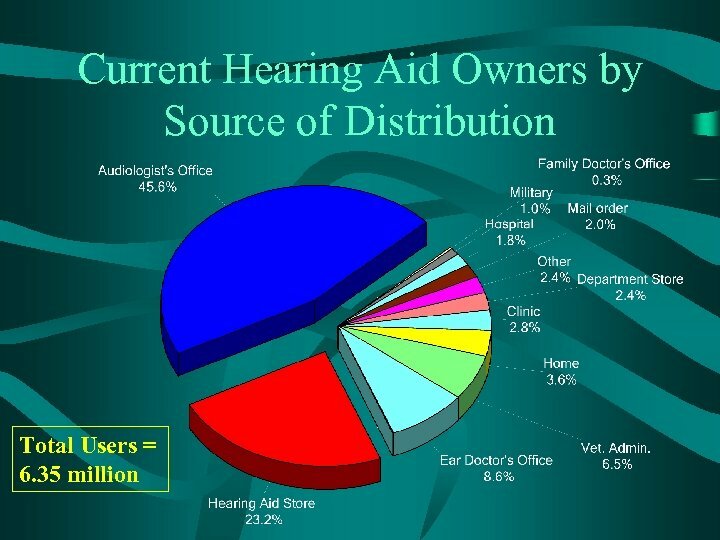 Hearing Instrument Fittings by Source of Distribution ØMail Order has grown 91% since 1997; 124, 000 hearing aid users. 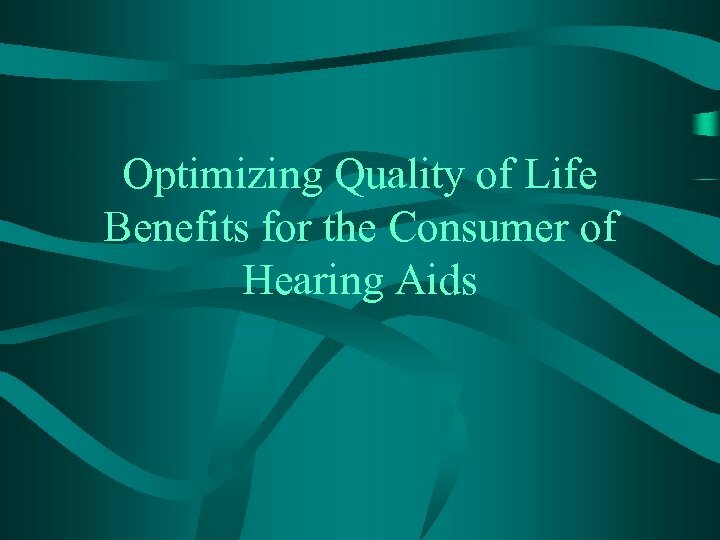 ØVA has grown 83% since 1997; 411, 000 hearing aid users. 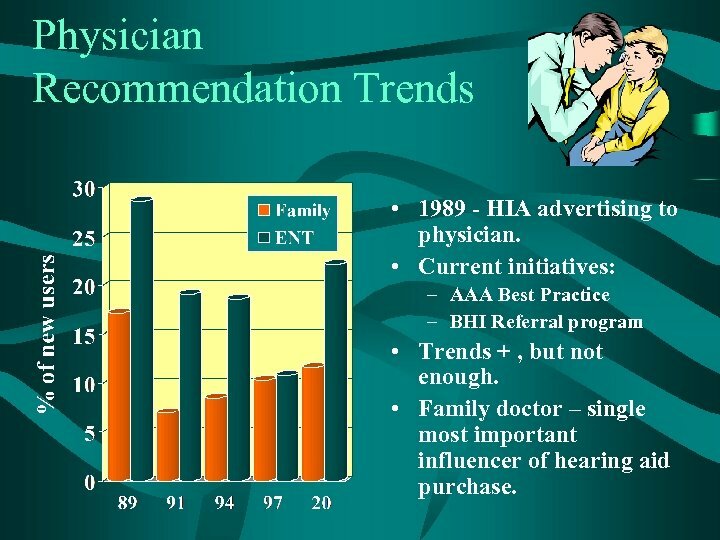 Physician Recommendation Trends • 1989 - HIA advertising to physician. 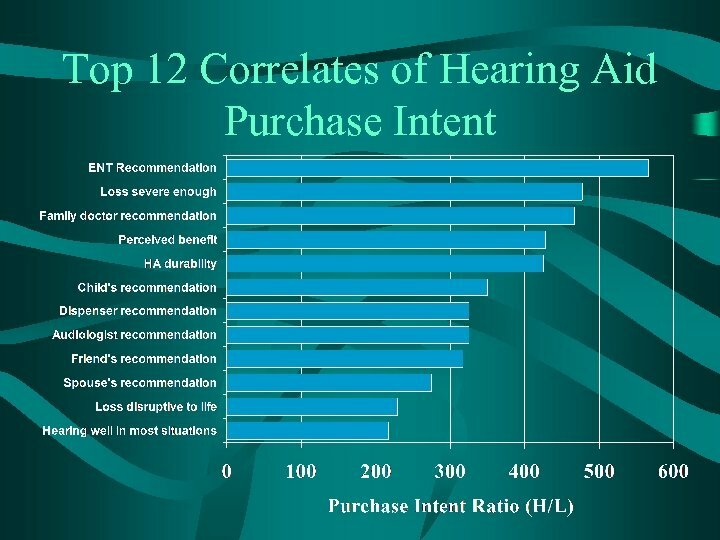 • Current initiatives: – AAA Best Practice – BHI Referral program • Trends + , but not enough. 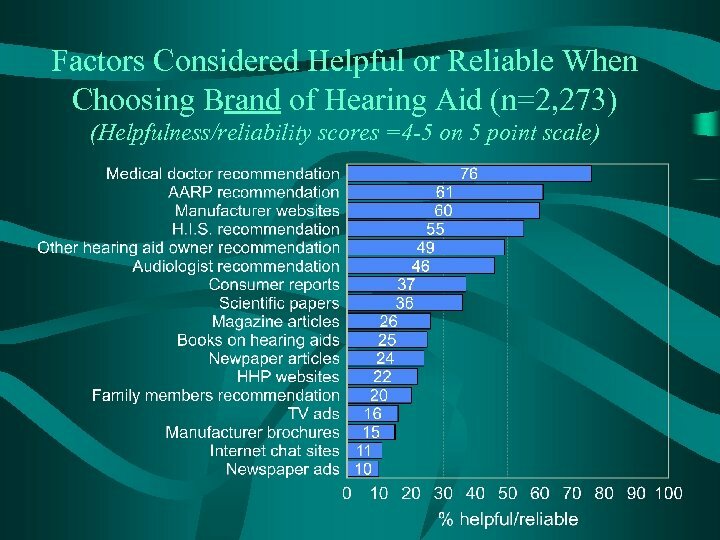 • Family doctor – single most important influencer of hearing aid purchase. 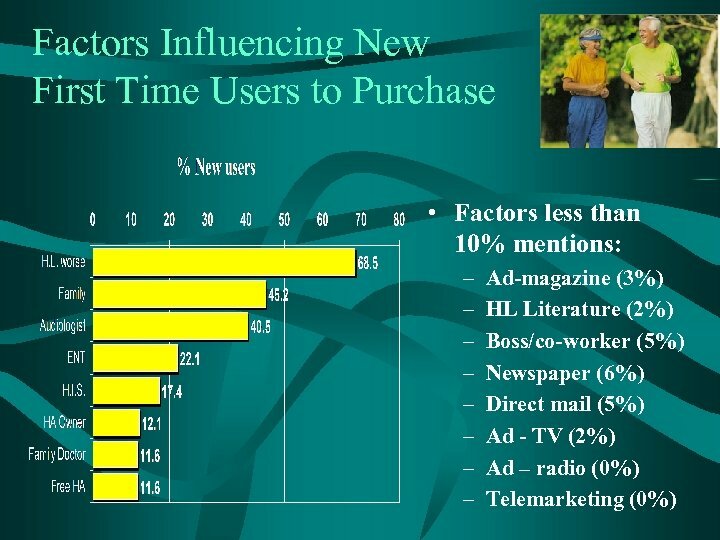 Factors Influencing New First Time Users to Purchase • Notable changes since last Marke. 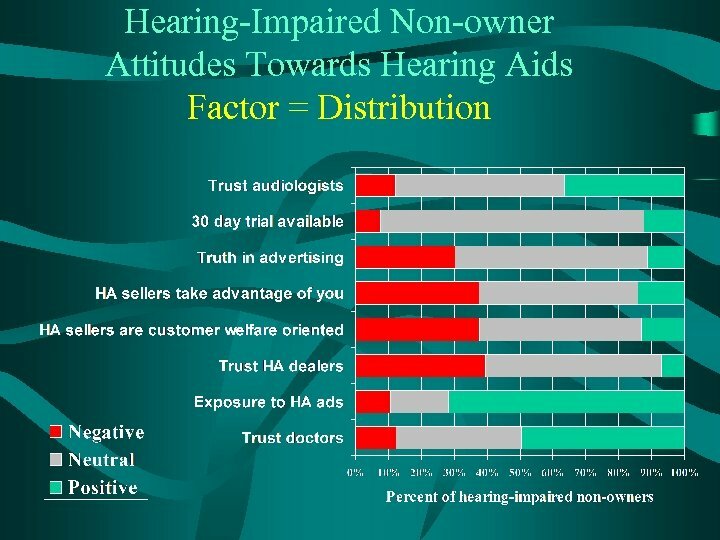 Trak: – Audiologist influence increased to 40. 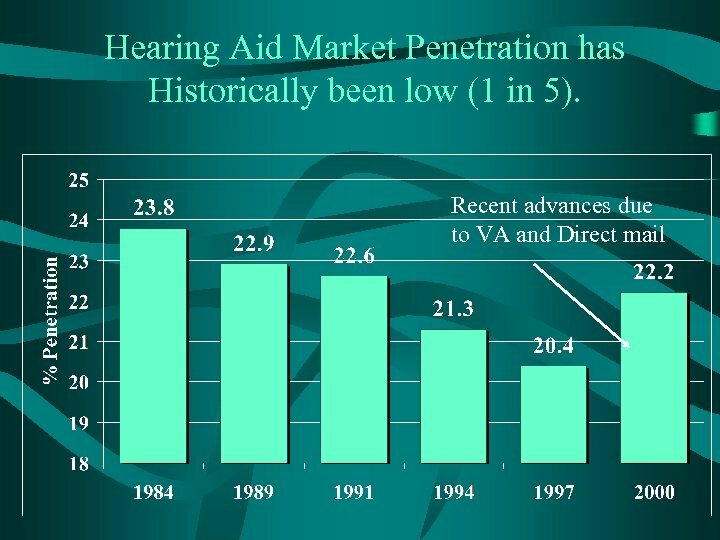 5% - up from 26% in 1997. 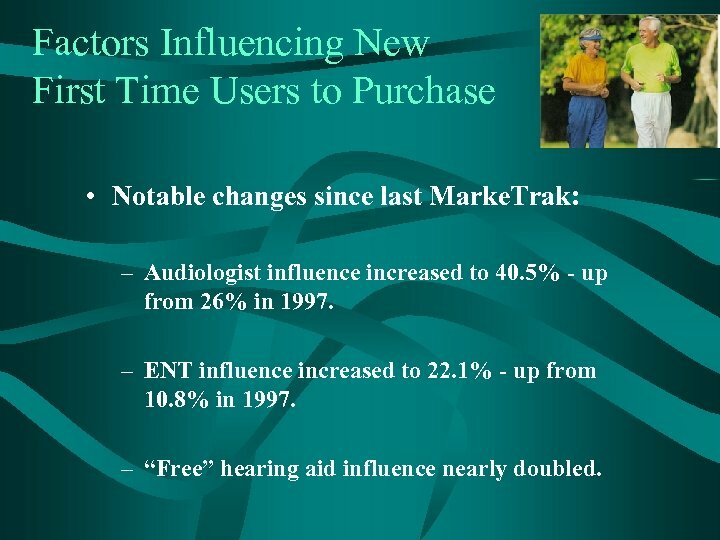 – ENT influence increased to 22. 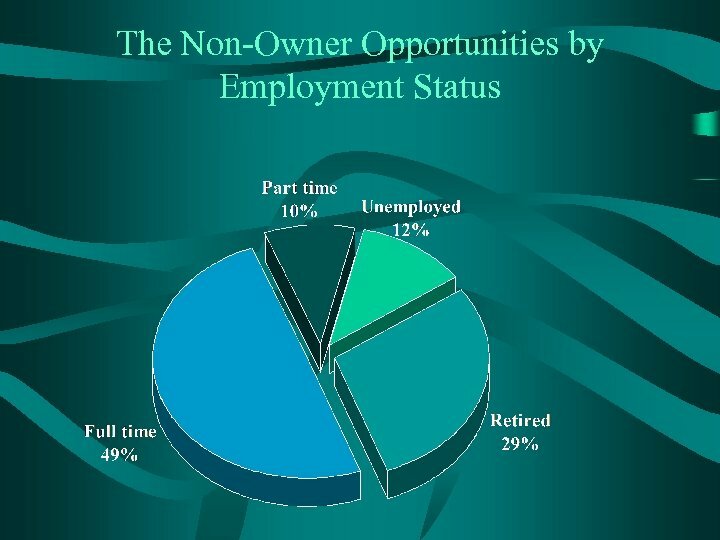 1% - up from 10. 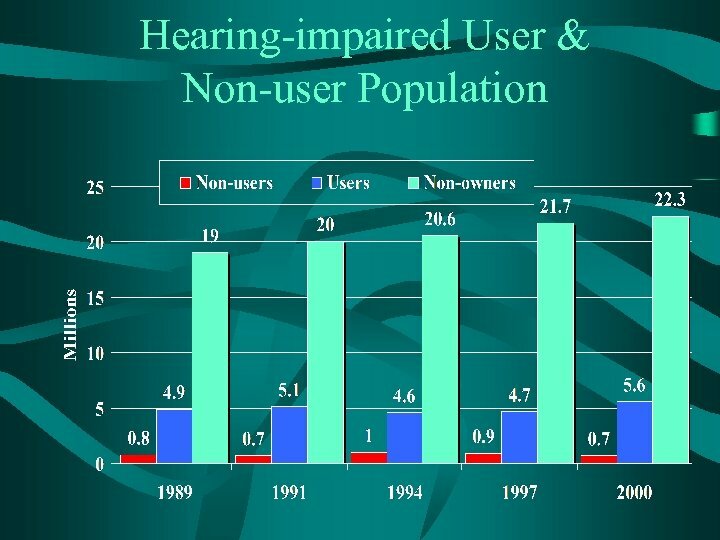 8% in 1997. 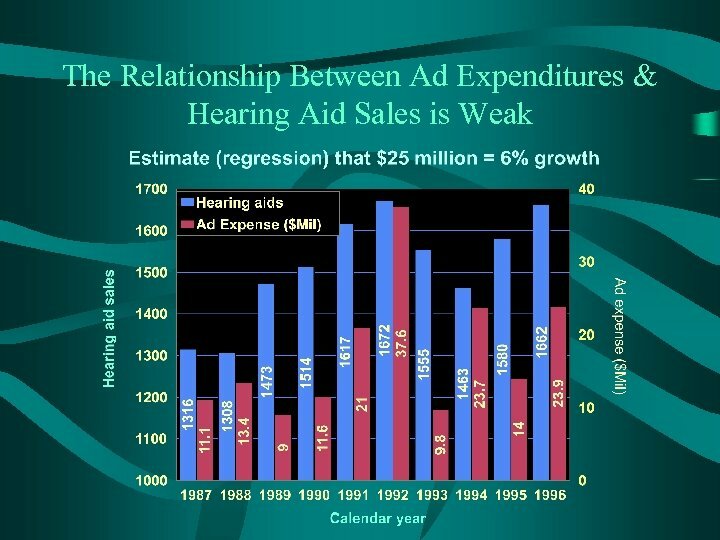 – “Free” hearing aid influence nearly doubled. 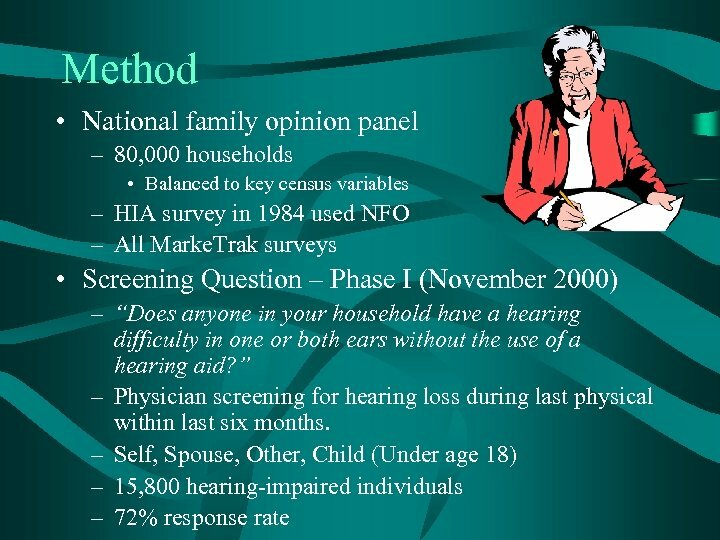 Conclusions • Hearing-impaired population > to 28. 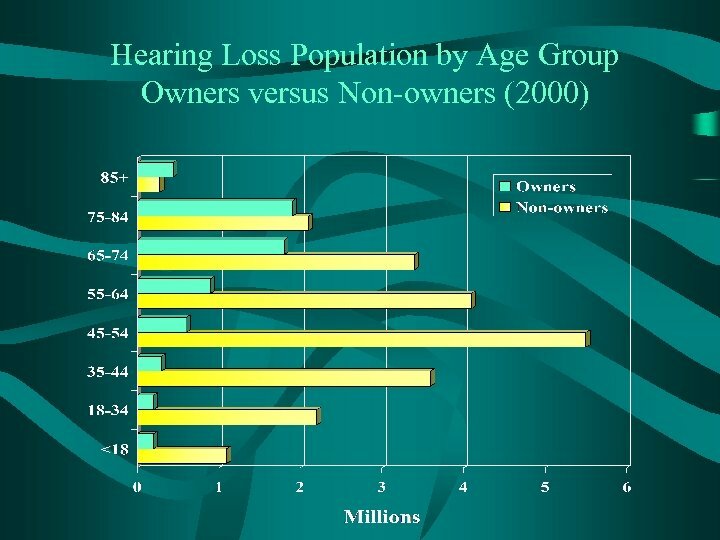 6 million. 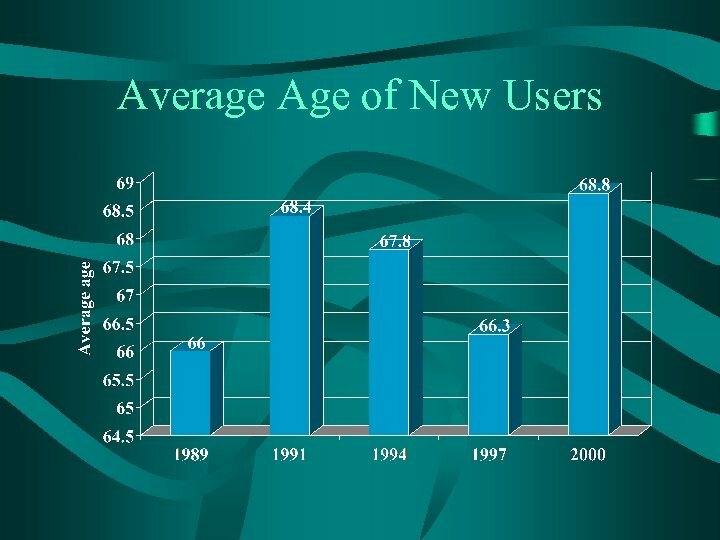 • Major increases in “Baby Boomer” and 75+ age brackets. 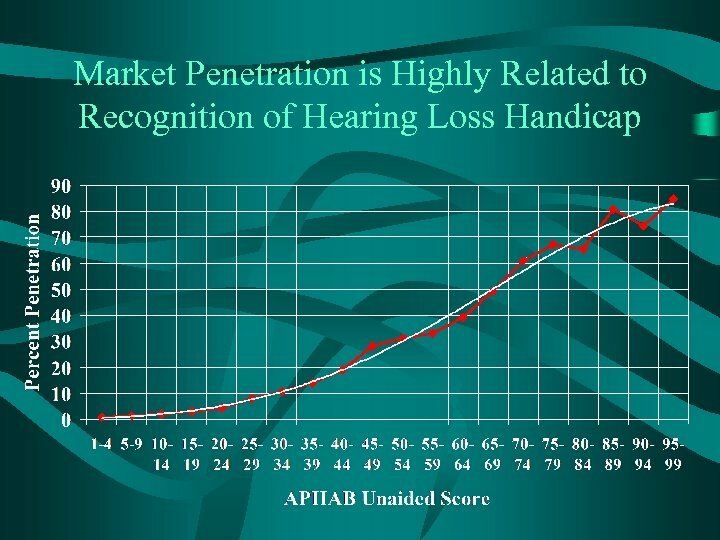 • Penetration increased to 22. 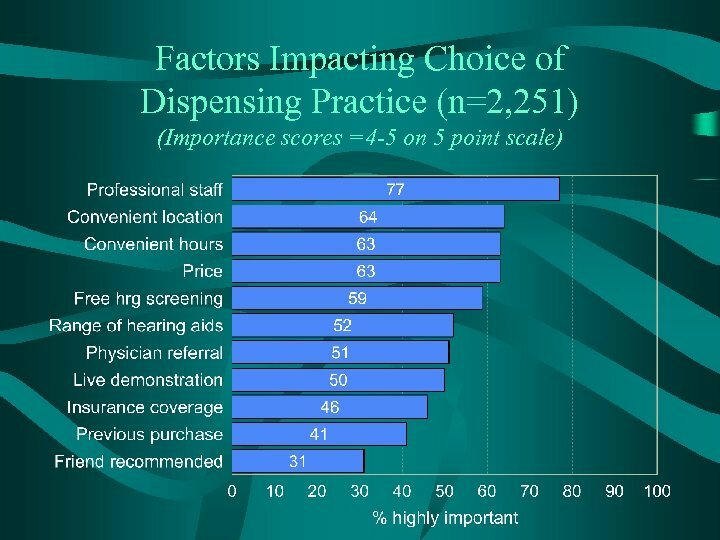 2%: – Free and direct mail impact • Physician screenings declined to 14%. 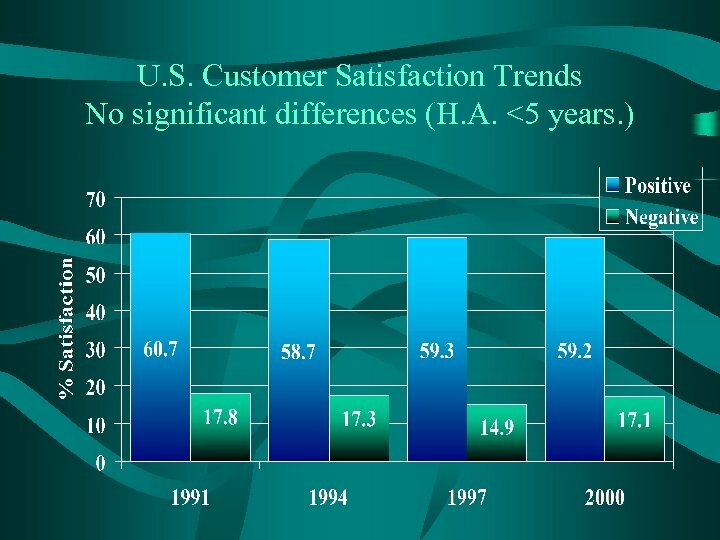 • Overall customer satisfaction unchanged. 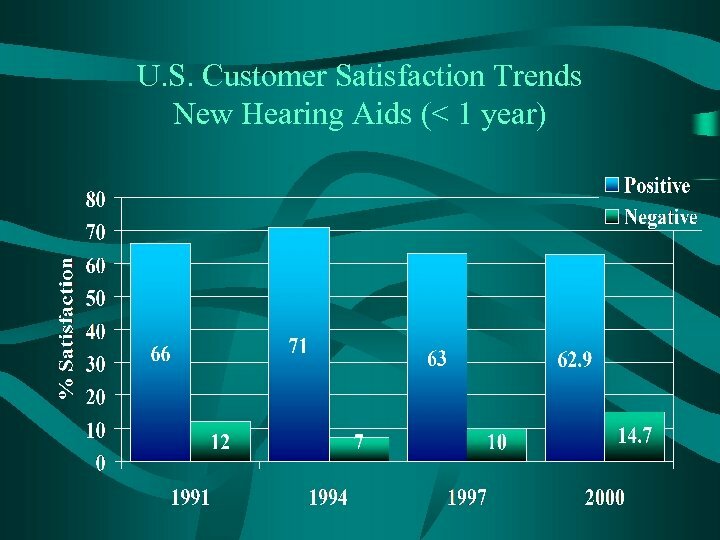 – New hearing aid satisfaction on decline • Hearing aids in the drawer improved to 11. 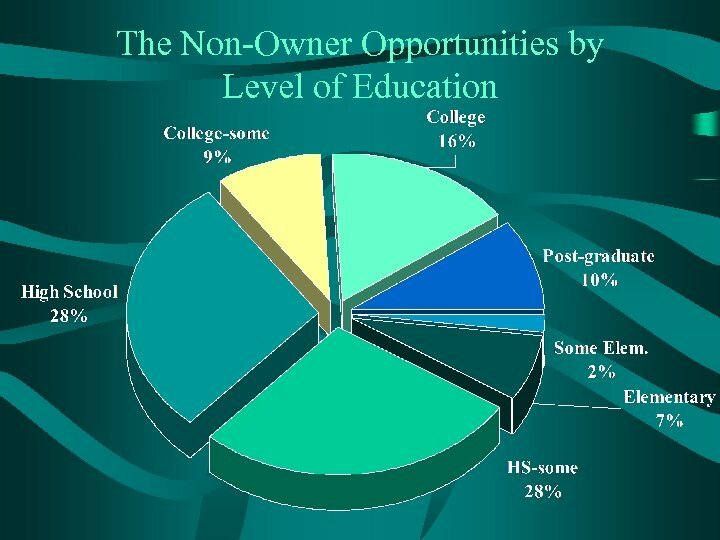 7%. 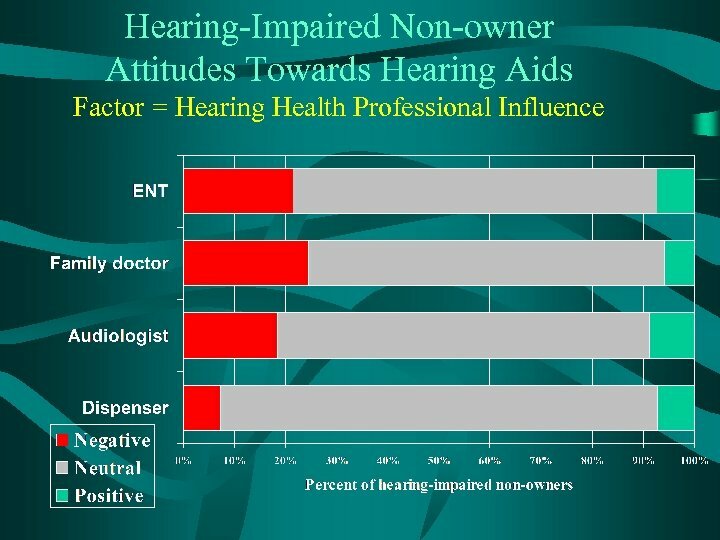 • Audiologist influence in dispensing continues to grow. 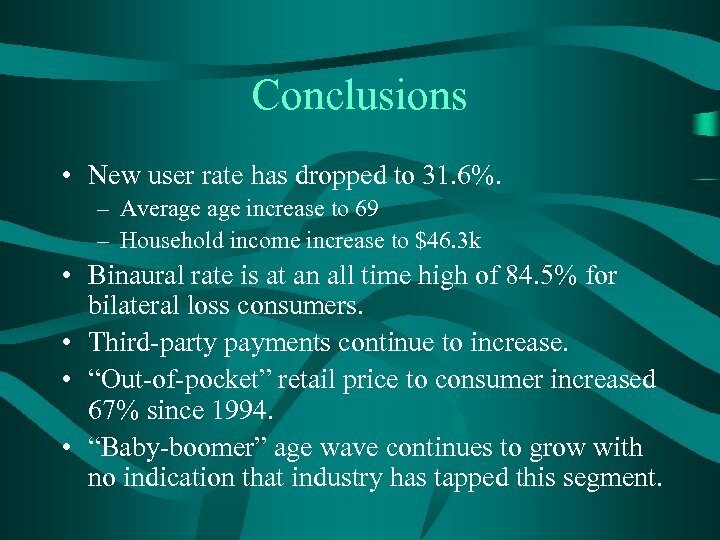 Conclusions • New user rate has dropped to 31. 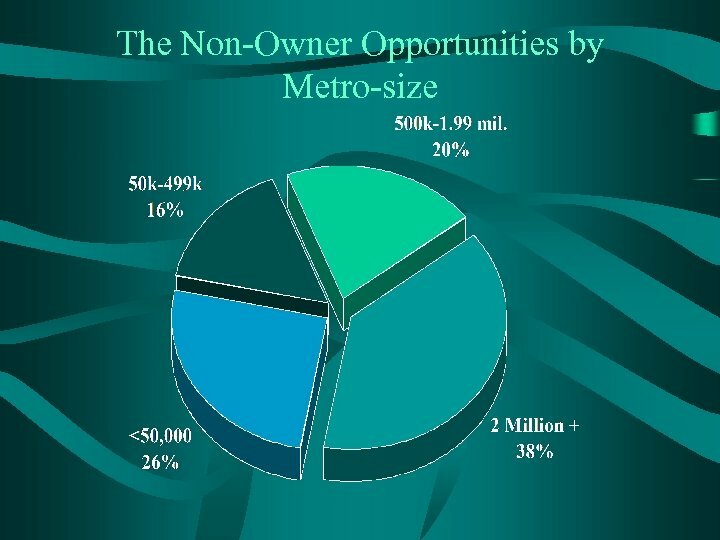 6%. 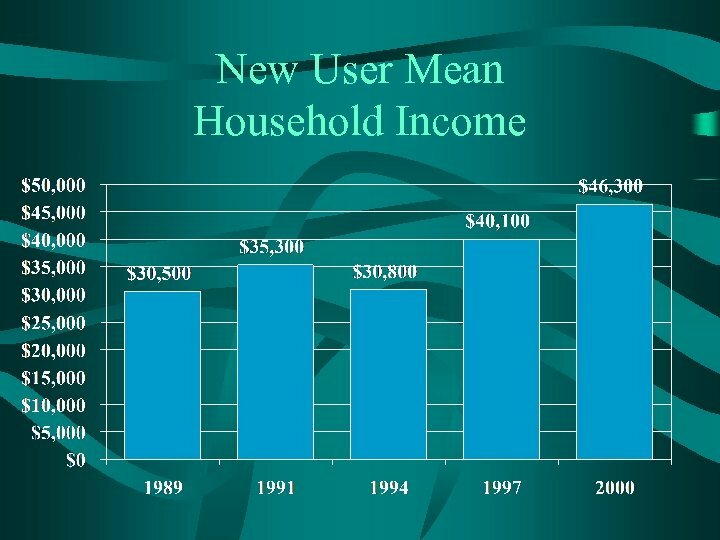 – Average increase to 69 – Household income increase to $46. 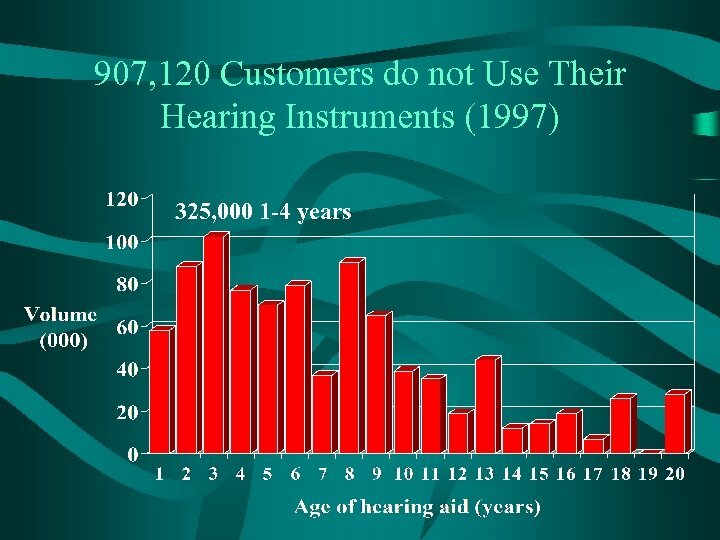 3 k • Binaural rate is at an all time high of 84. 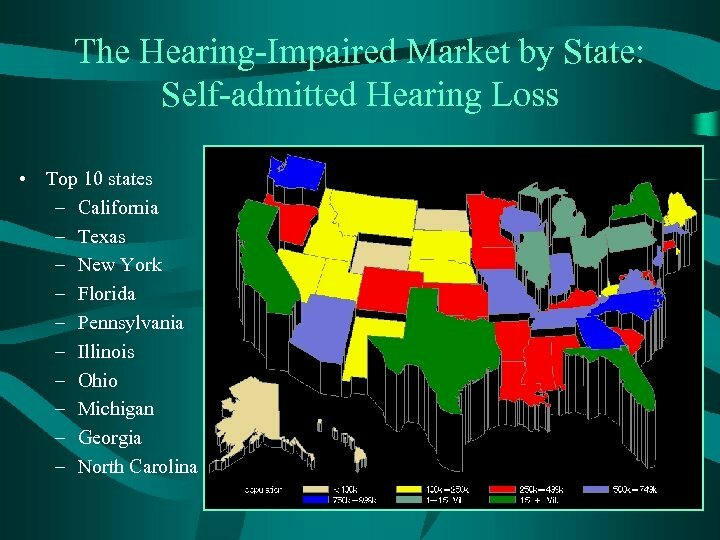 5% for bilateral loss consumers. 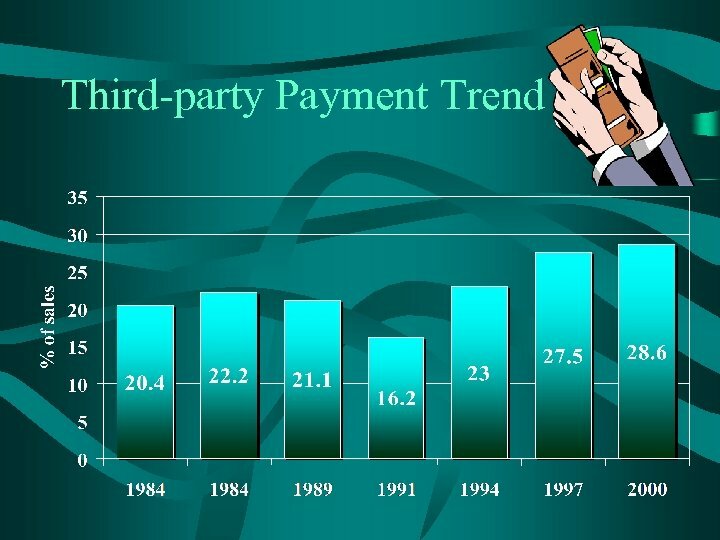 • Third-party payments continue to increase. 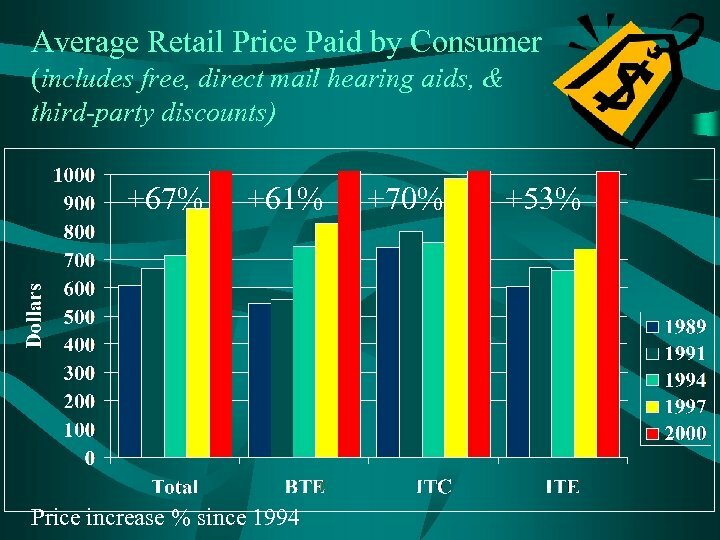 • “Out-of-pocket” retail price to consumer increased 67% since 1994. 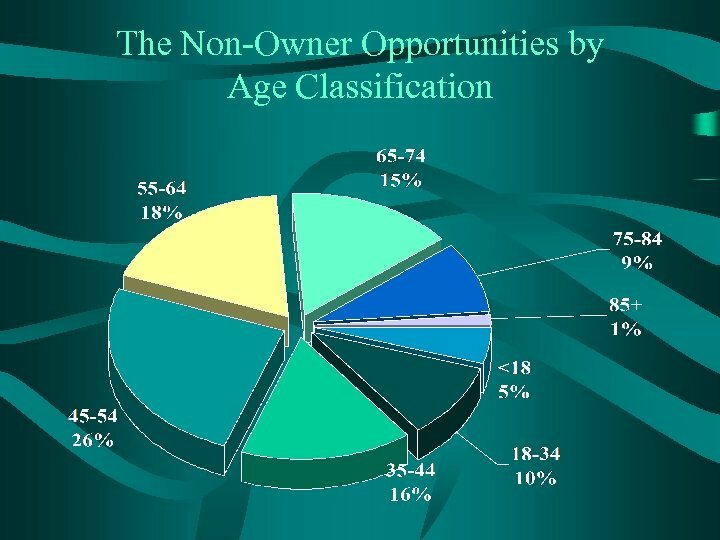 • “Baby-boomer” age wave continues to grow with no indication that industry has tapped this segment. 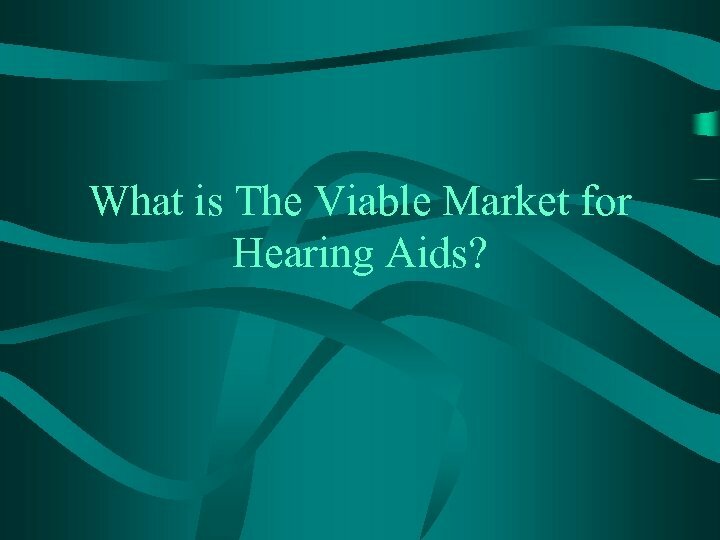 What is The Viable Market for Hearing Aids? 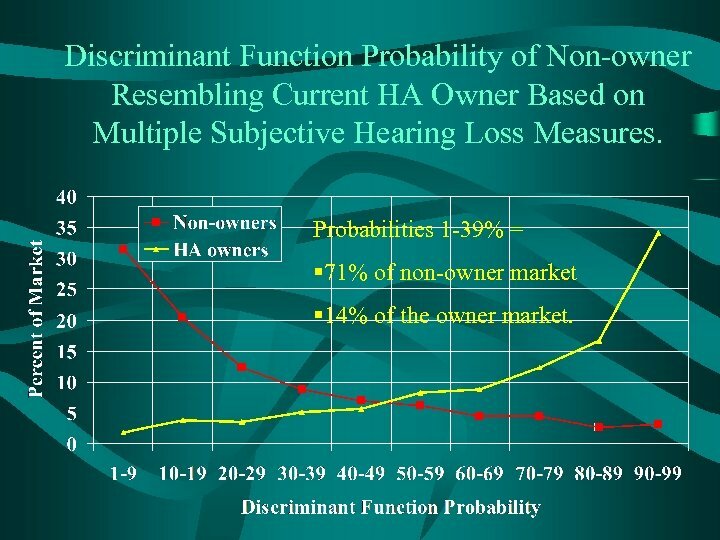 Discriminant Function Probability of Non-owner Resembling Current HA Owner Based on Multiple Subjective Hearing Loss Measures. 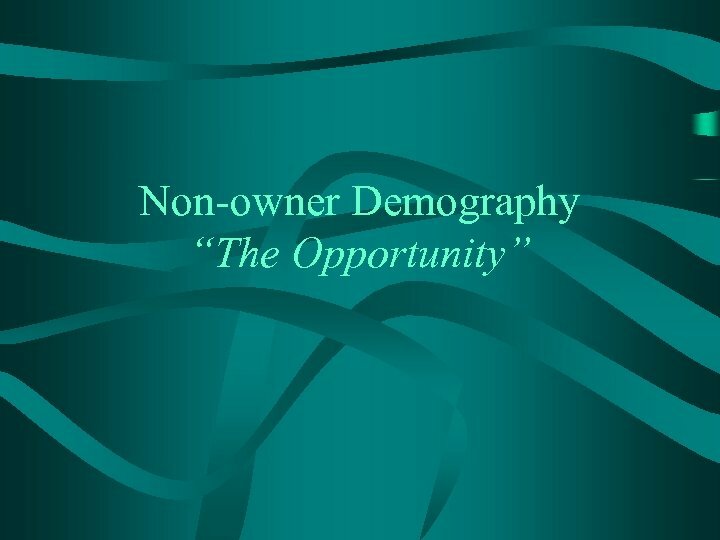 Probabilities 1 -39% = § 71% of non-owner market § 14% of the owner market. 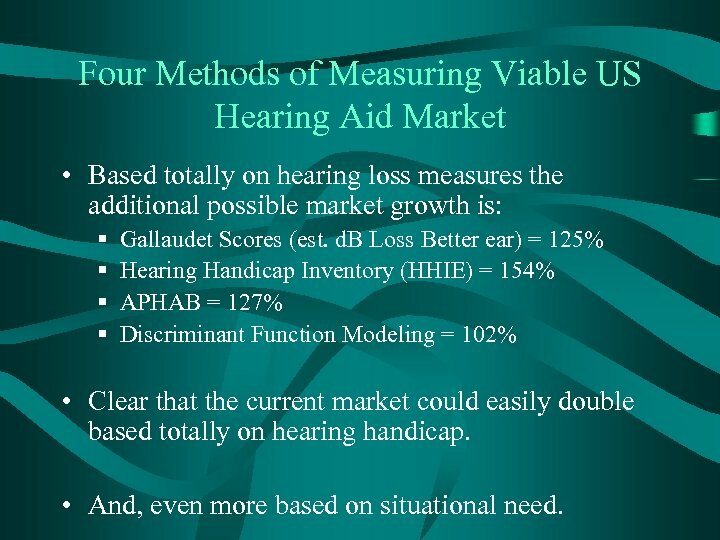 Four Methods of Measuring Viable US Hearing Aid Market • Based totally on hearing loss measures the additional possible market growth is: § § Gallaudet Scores (est. 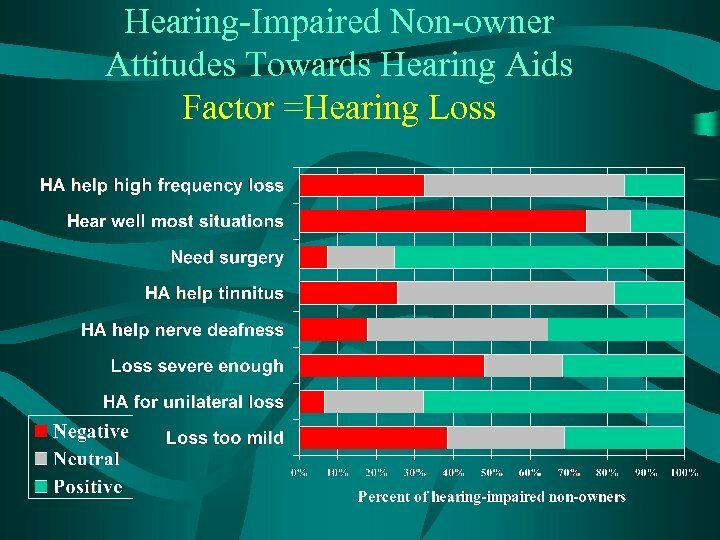 d. B Loss Better ear) = 125% Hearing Handicap Inventory (HHIE) = 154% APHAB = 127% Discriminant Function Modeling = 102% • Clear that the current market could easily double based totally on hearing handicap. 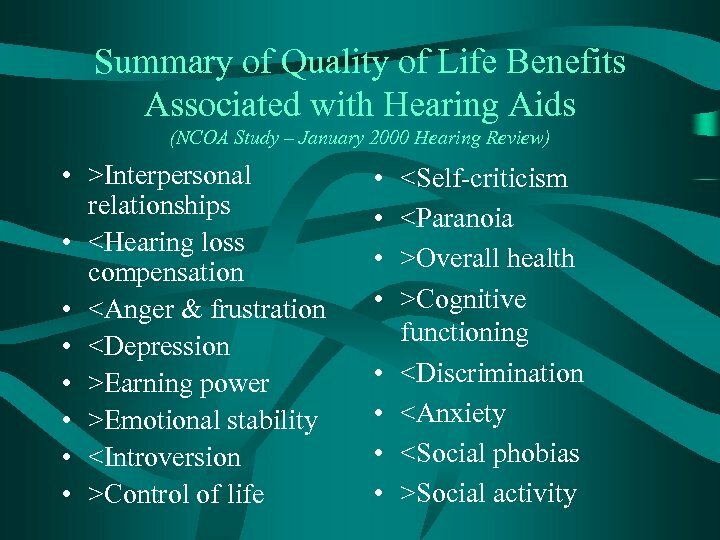 • And, even more based on situational need. 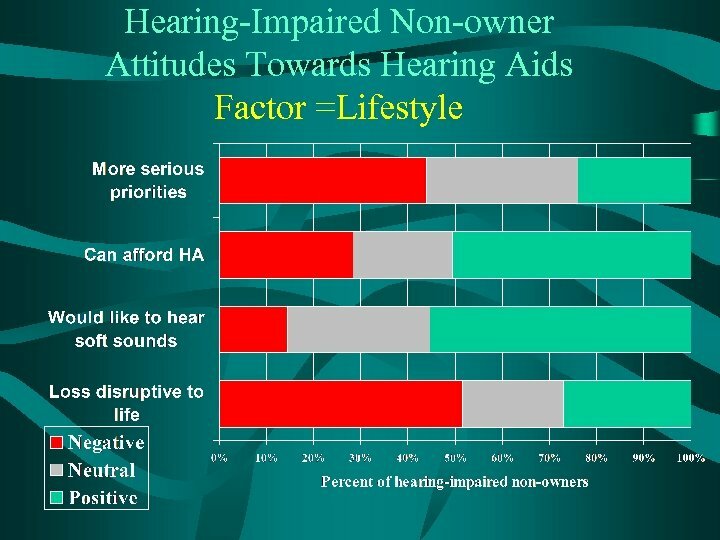 Attitudes Per Se are Important, But Relationship to Hearing Aid Purchase Intent is Perhaps More Important • Sample of 2, 753 non-owners • Measured their attitudes on 76 issues. 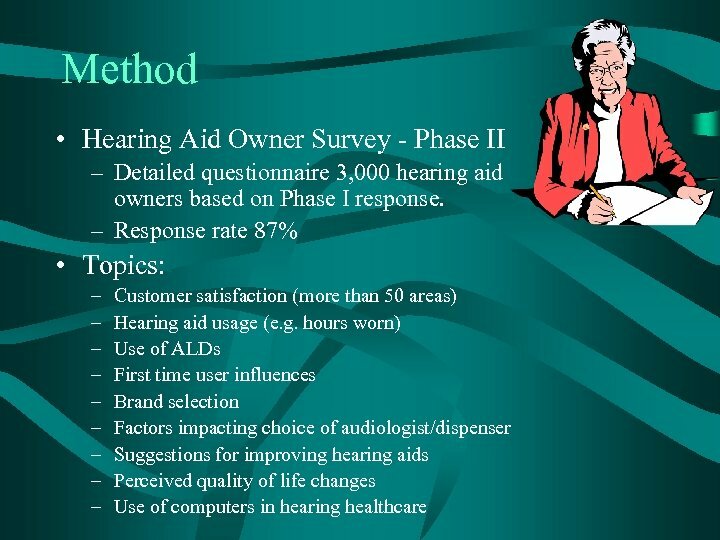 • Measured their hearing aid purchase intent in the next five years. 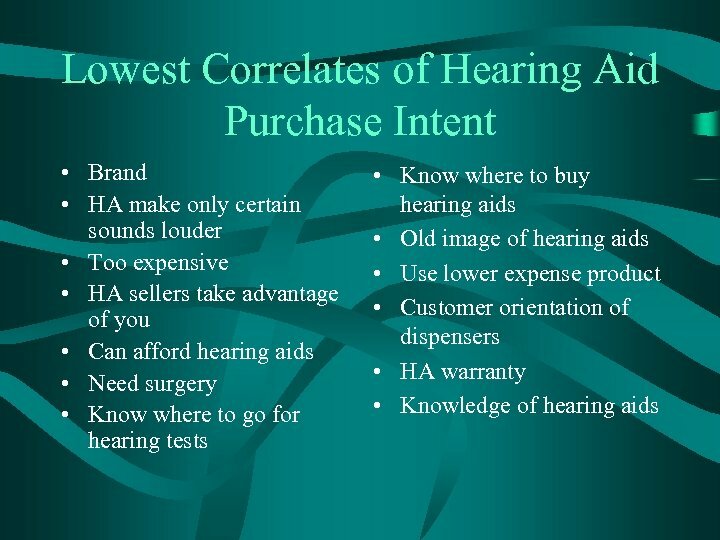 • Categorized them as a high or low purchase intenders. 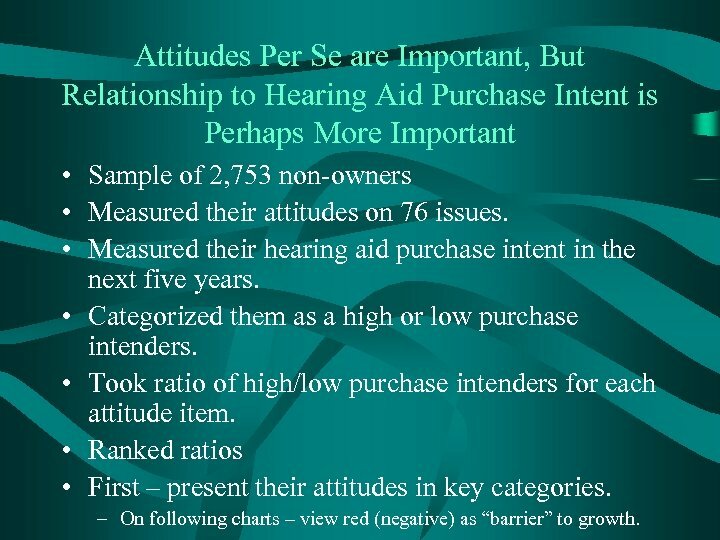 • Took ratio of high/low purchase intenders for each attitude item. 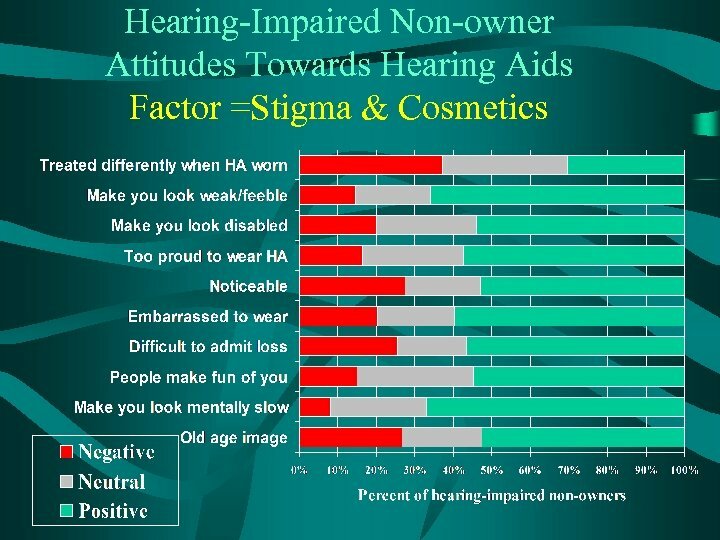 • Ranked ratios • First – present their attitudes in key categories. 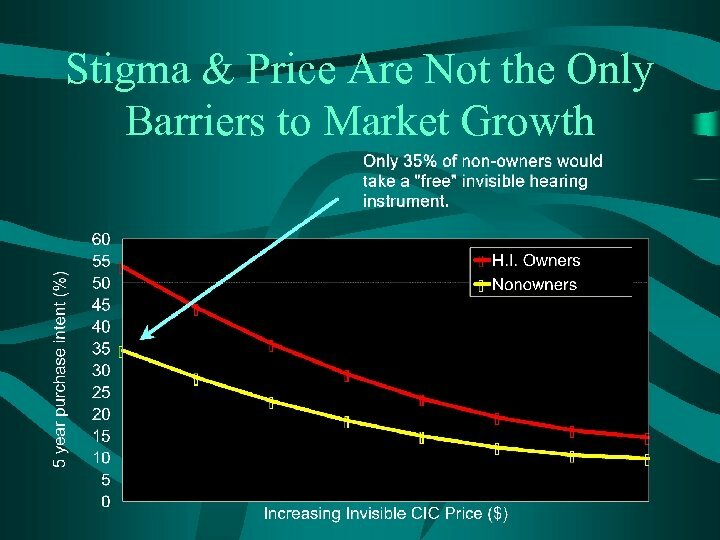 – On following charts – view red (negative) as “barrier” to growth. 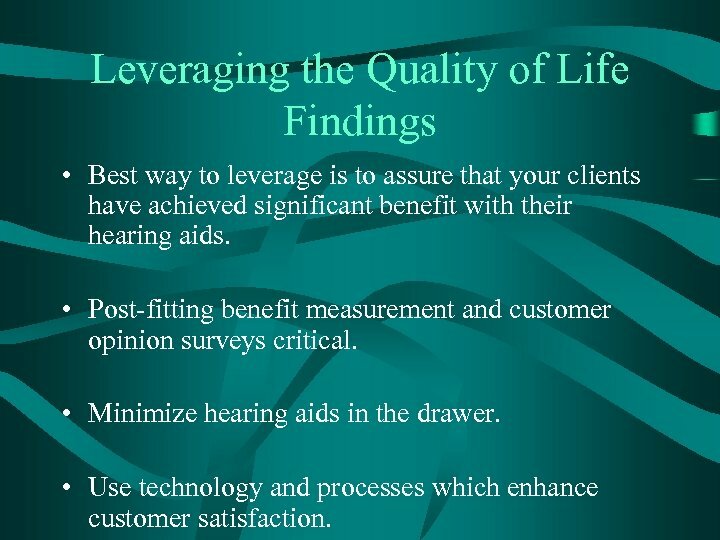 Leveraging the Quality of Life Findings • Best way to leverage is to assure that your clients have achieved significant benefit with their hearing aids. 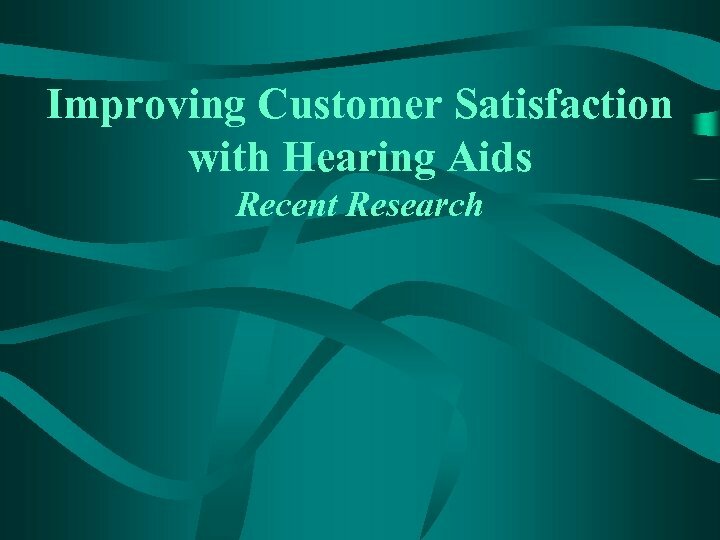 • Post-fitting benefit measurement and customer opinion surveys critical. 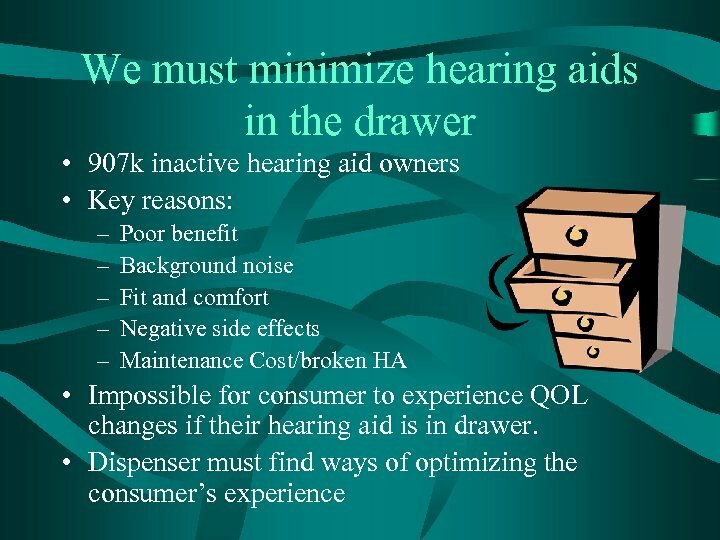 • Minimize hearing aids in the drawer. 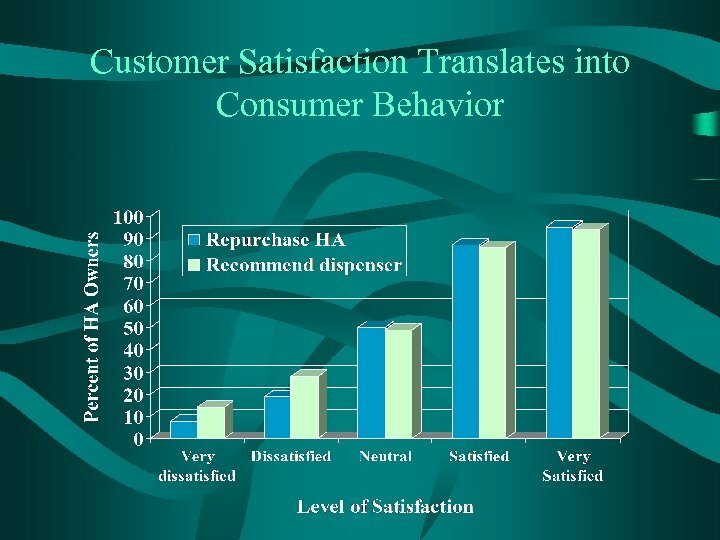 • Use technology and processes which enhance customer satisfaction. 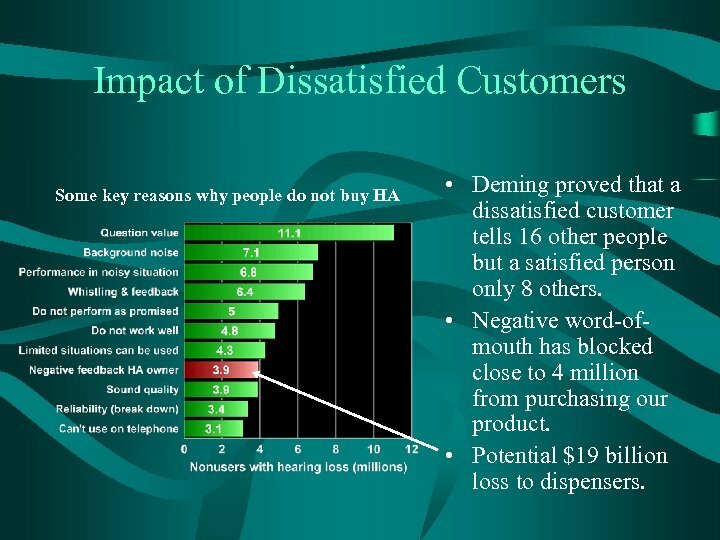 Impact of Dissatisfied Customers Some key reasons why people do not buy HA • Deming proved that a dissatisfied customer tells 16 other people but a satisfied person only 8 others. 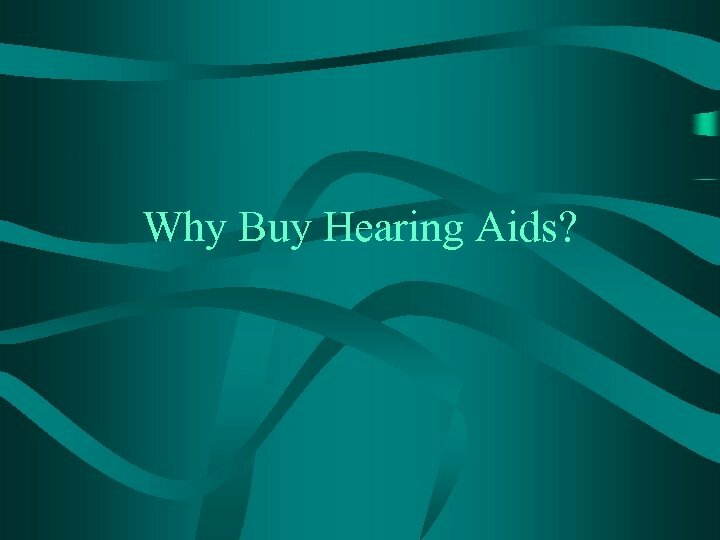 • Negative word-ofmouth has blocked close to 4 million from purchasing our product. 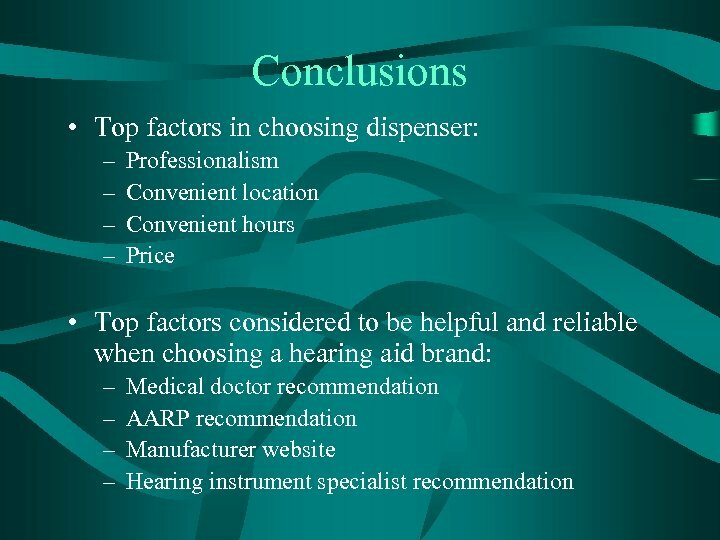 • Potential $19 billion loss to dispensers. 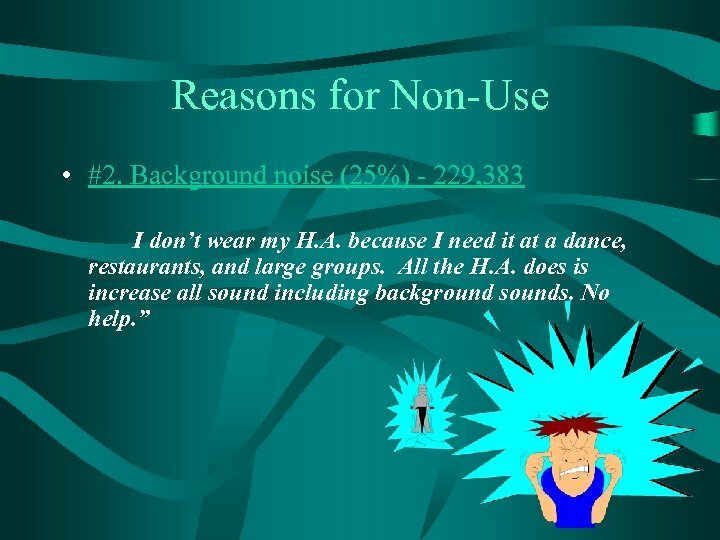 Reasons for Non-Use • #4. 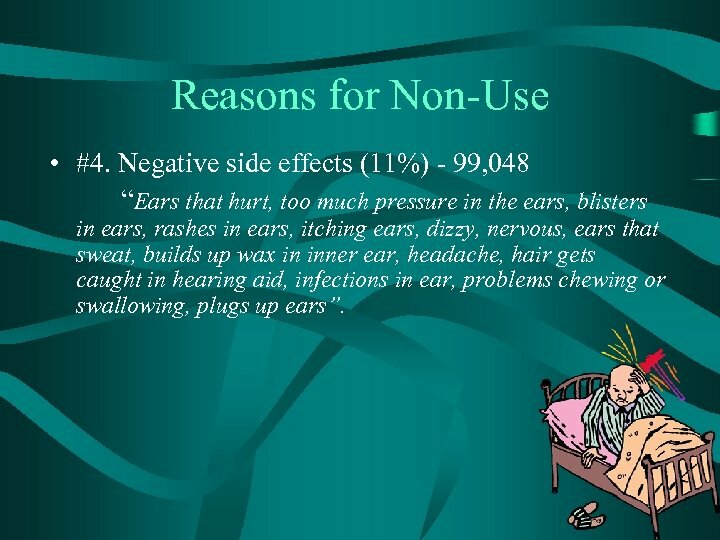 Negative side effects (11%) - 99, 048 “Ears that hurt, too much pressure in the ears, blisters in ears, rashes in ears, itching ears, dizzy, nervous, ears that sweat, builds up wax in inner ear, headache, hair gets caught in hearing aid, infections in ear, problems chewing or swallowing, plugs up ears”. 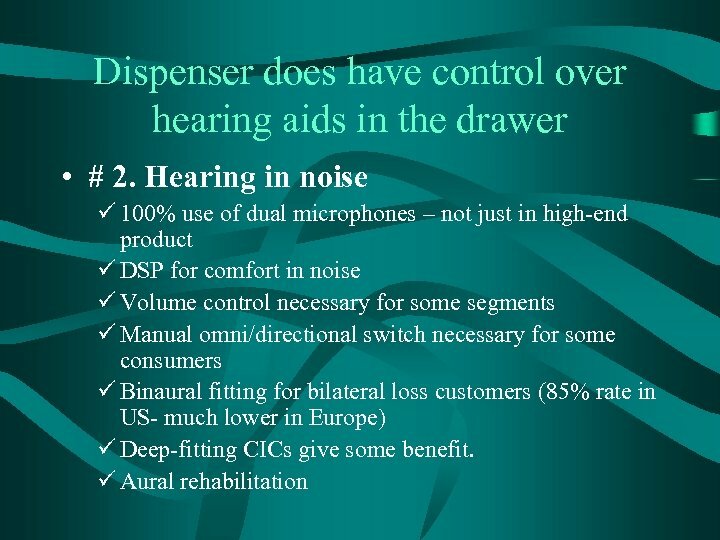 Dispenser does have control over hearing aids in the drawer • # 1. 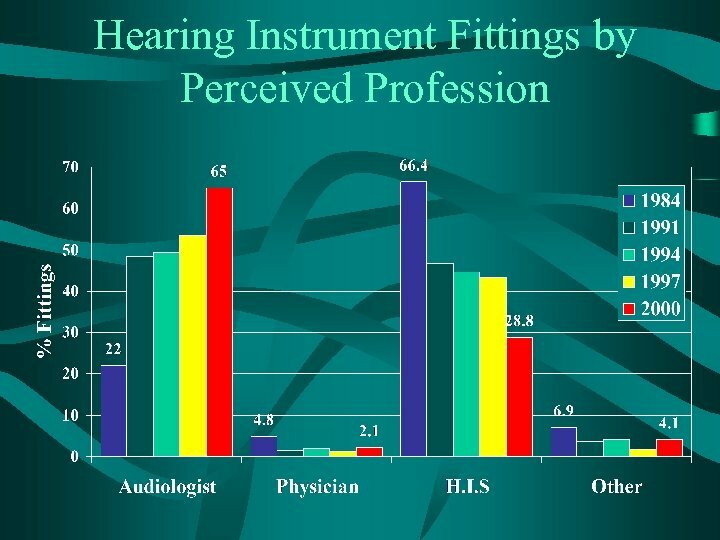 Poor benefit: ü Use programmable technology (analog or DSP) ü Pre-post benefit measurement ü Real ear measurement ü 90 day post fitting customer satisfaction survey. 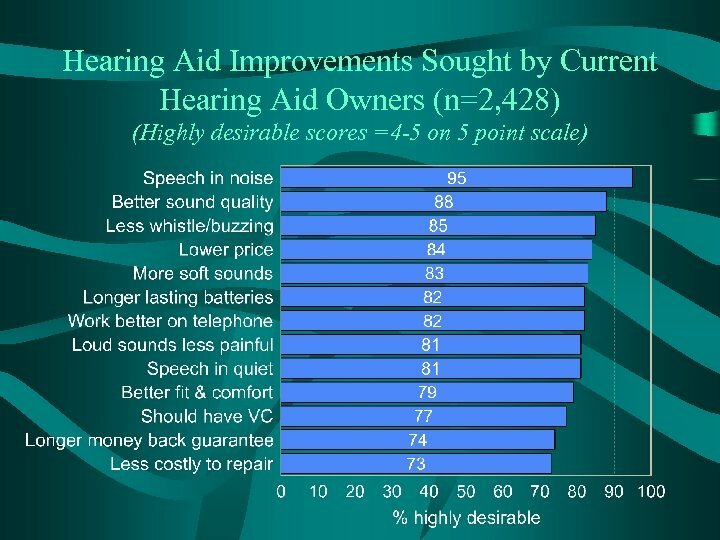 ü 100% money back guarantee ü Aural rehabilitation • Significant impact on hearing aid satisfaction. 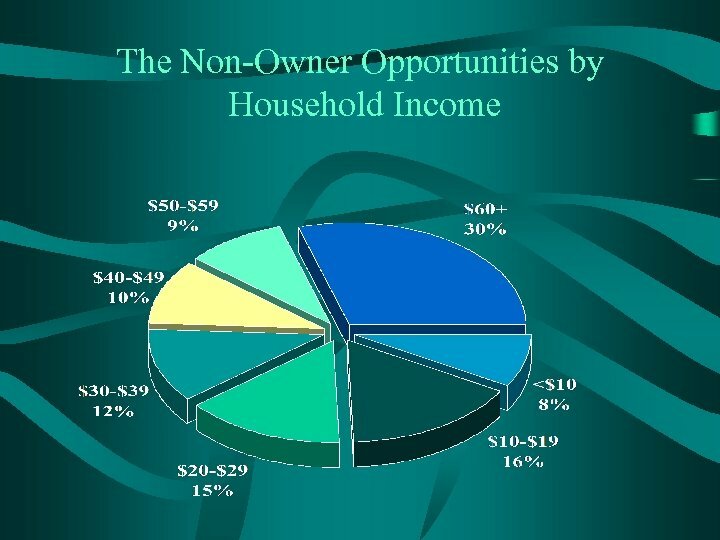 • Return rates been shown to be cut in half. 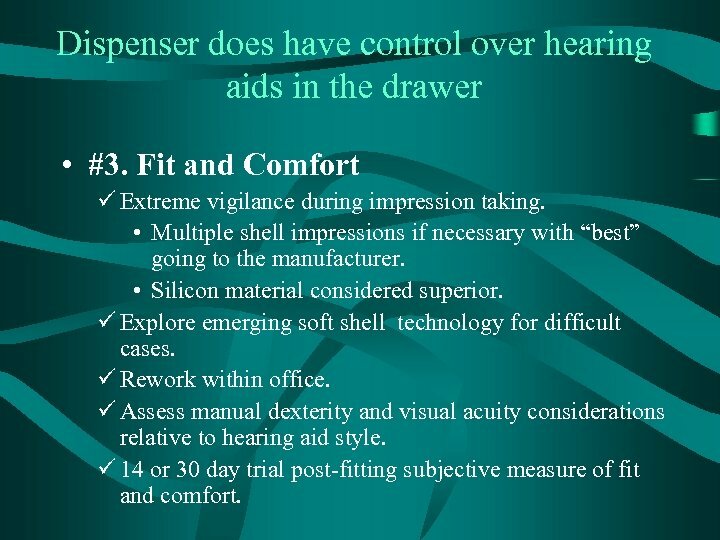 Dispenser does have control over hearing aids in the drawer • #3. Fit and Comfort ü Extreme vigilance during impression taking. 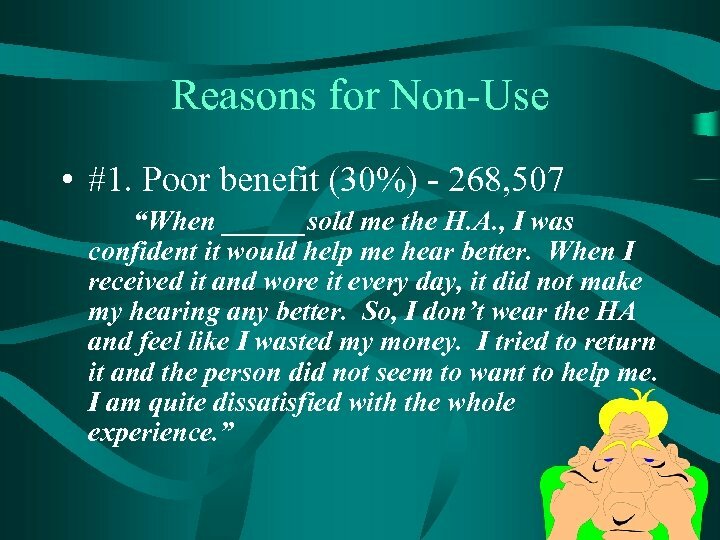 • Multiple shell impressions if necessary with “best” going to the manufacturer. 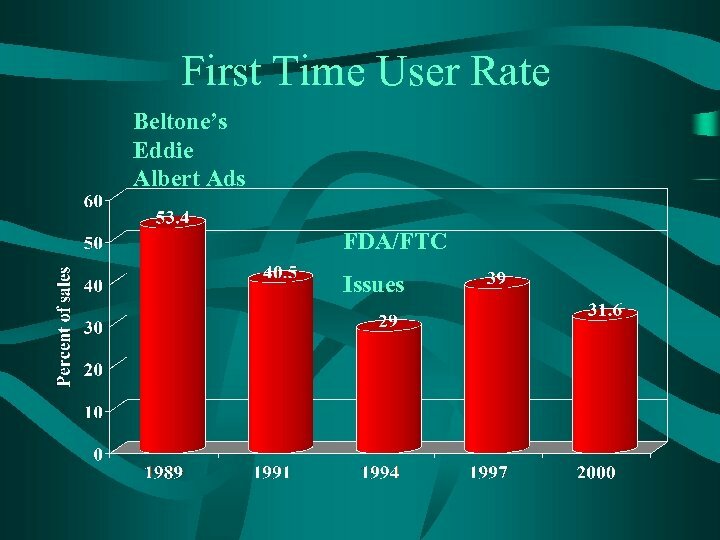 • Silicon material considered superior. 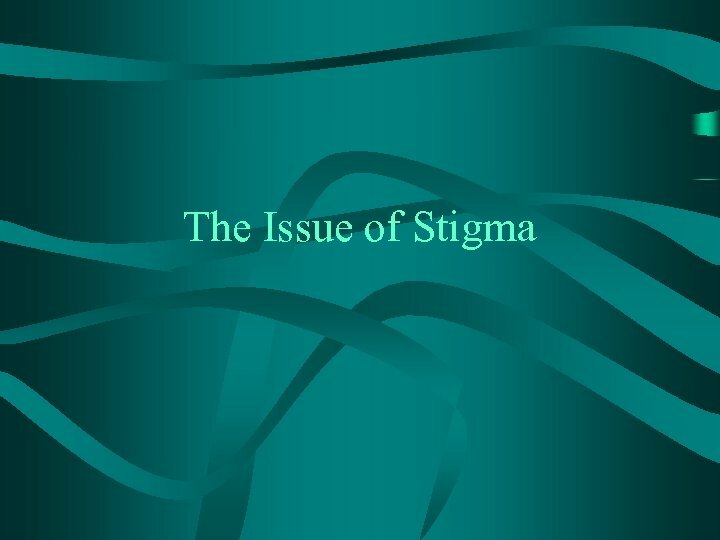 ü Explore emerging soft shell technology for difficult cases. ü Rework within office. 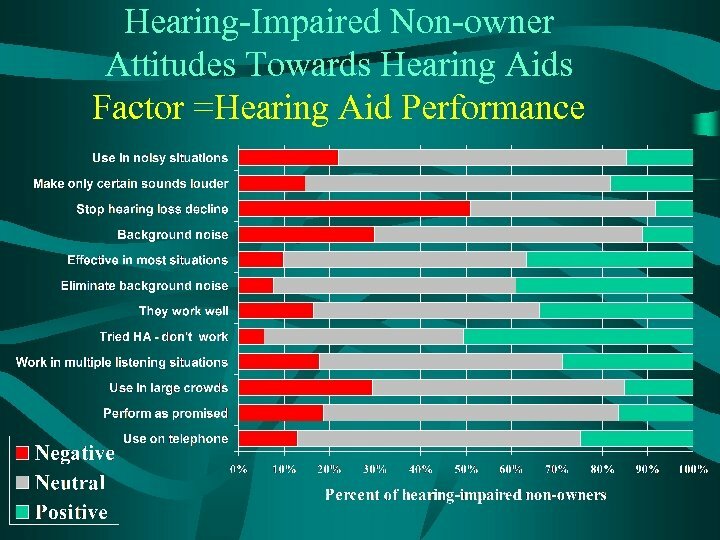 ü Assess manual dexterity and visual acuity considerations relative to hearing aid style. 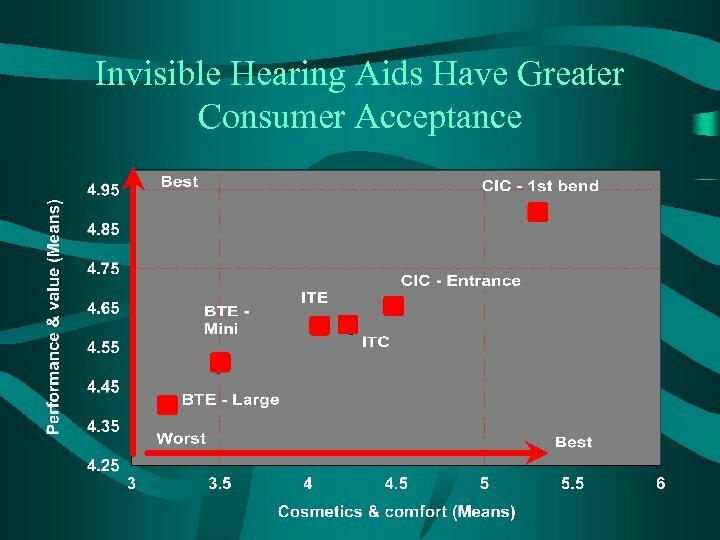 ü 14 or 30 day trial post-fitting subjective measure of fit and comfort. 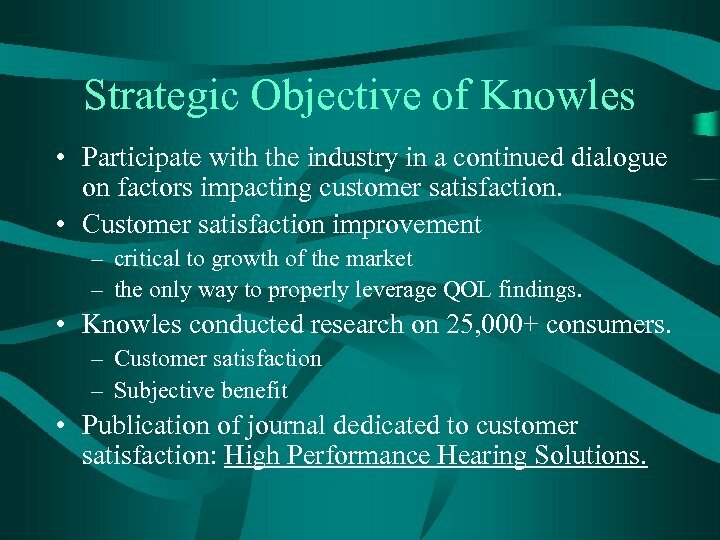 Strategic Objective of Knowles • Participate with the industry in a continued dialogue on factors impacting customer satisfaction. 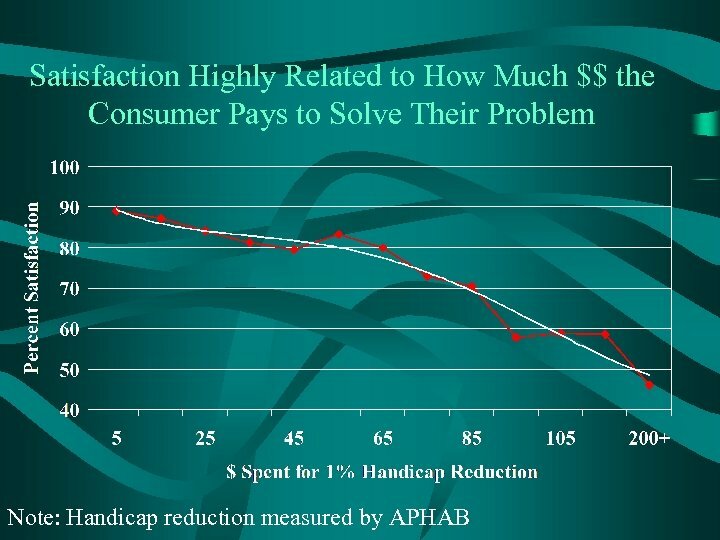 • Customer satisfaction improvement – critical to growth of the market – the only way to properly leverage QOL findings. 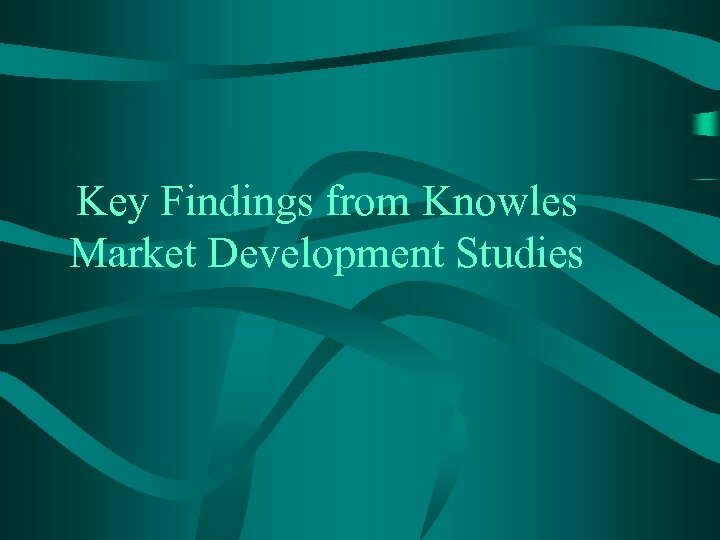 • Knowles conducted research on 25, 000+ consumers. 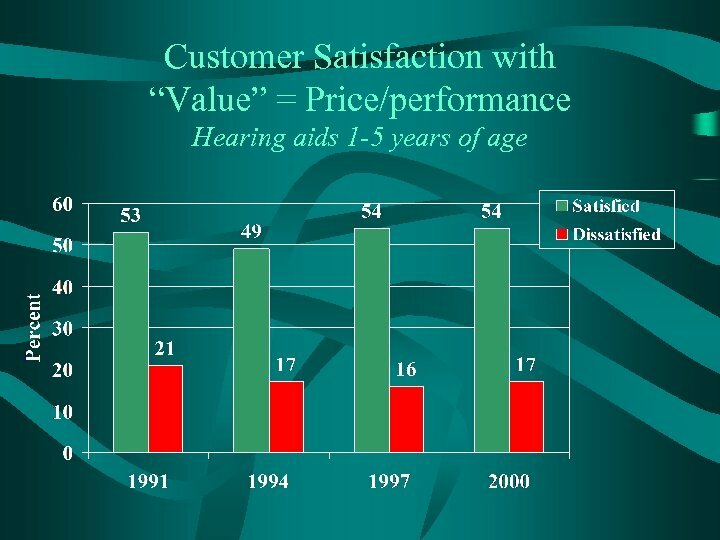 – Customer satisfaction – Subjective benefit • Publication of journal dedicated to customer satisfaction: High Performance Hearing Solutions. 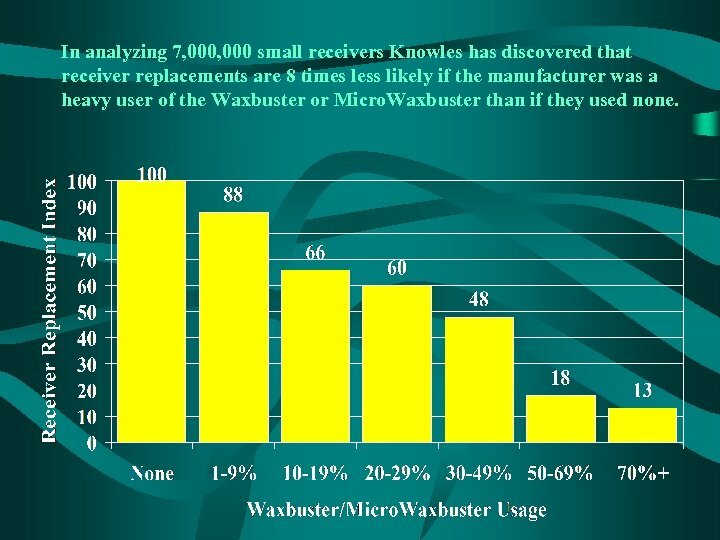 In analyzing 7, 000 small receivers Knowles has discovered that receiver replacements are 8 times less likely if the manufacturer was a heavy user of the Waxbuster or Micro. 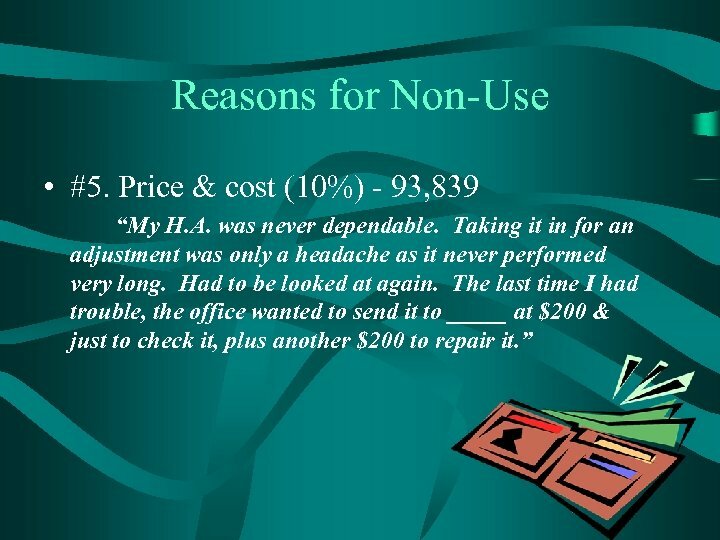 Waxbuster than if they used none. 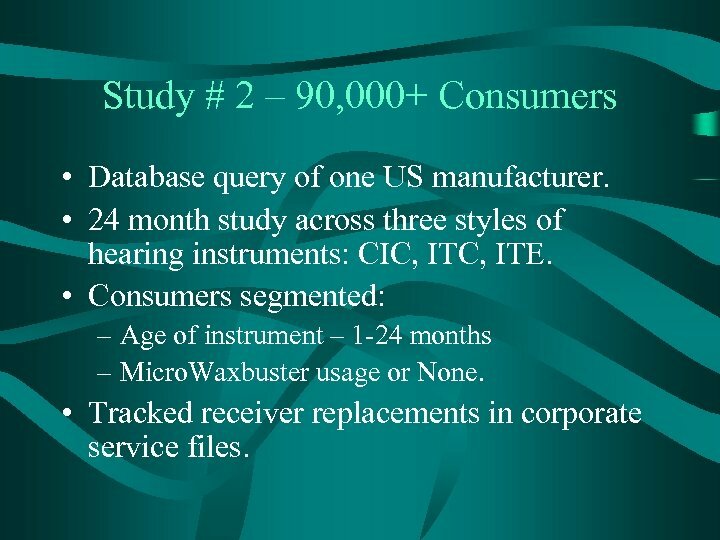 Study # 2 – 90, 000+ Consumers • Database query of one US manufacturer. 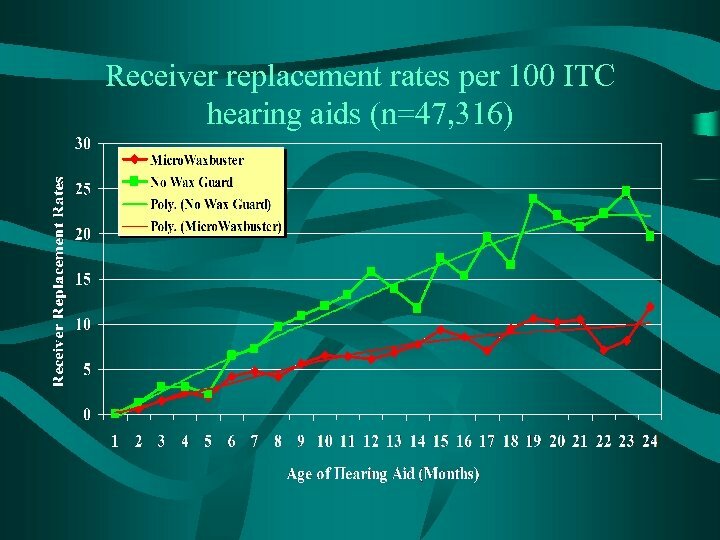 • 24 month study across three styles of hearing instruments: CIC, ITE. 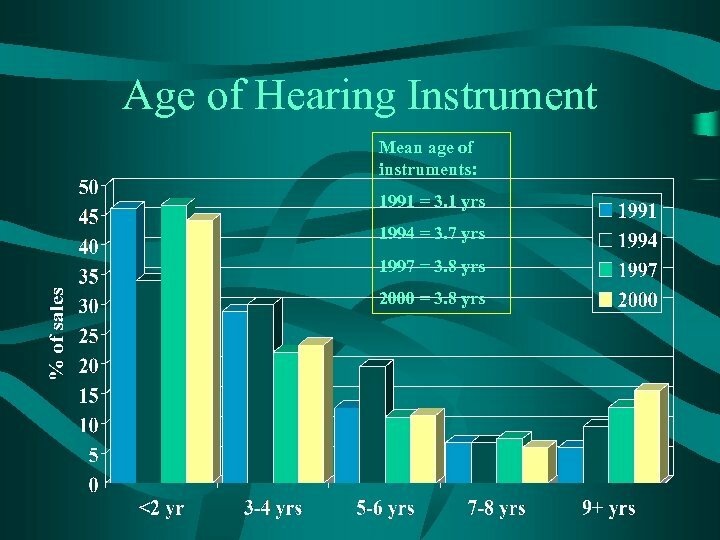 • Consumers segmented: – Age of instrument – 1 -24 months – Micro. 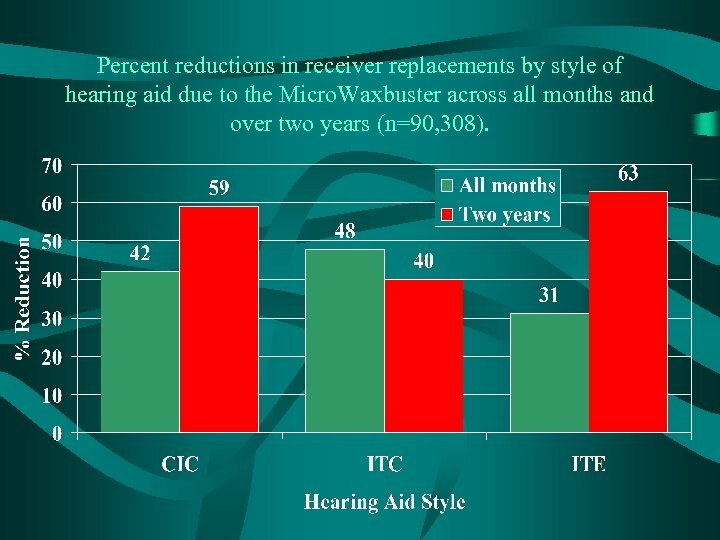 Waxbuster usage or None. 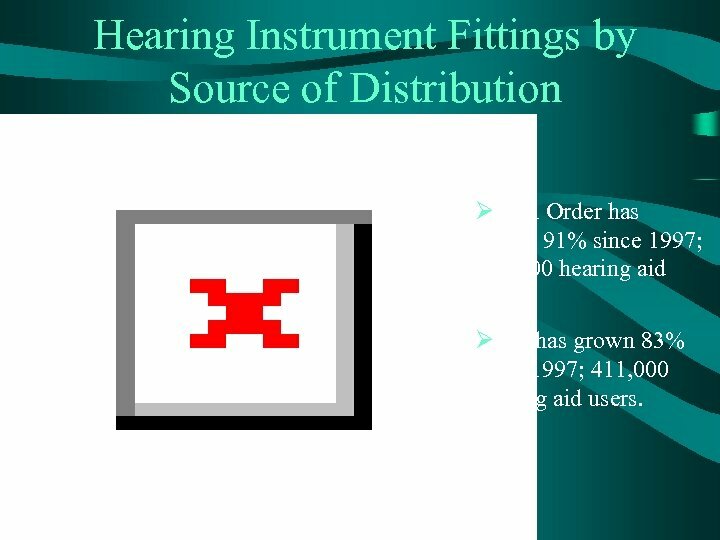 • Tracked receiver replacements in corporate service files. 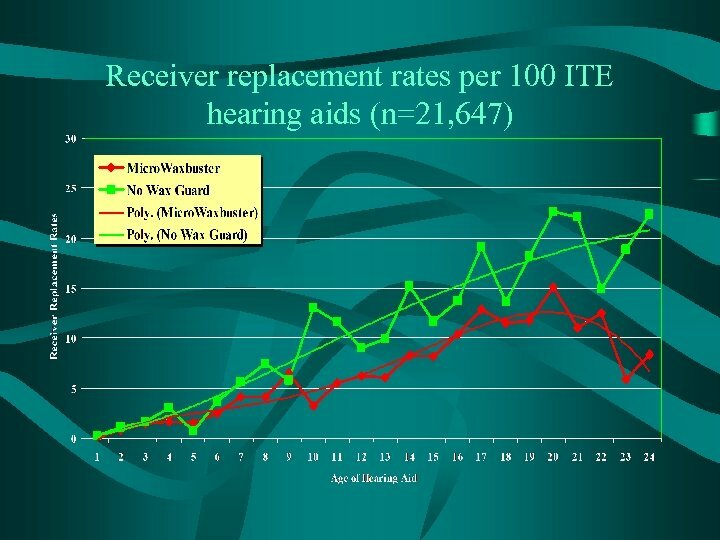 Percent reductions in receiver replacements by style of hearing aid due to the Micro. Waxbuster across all months and over two years (n=90, 308). 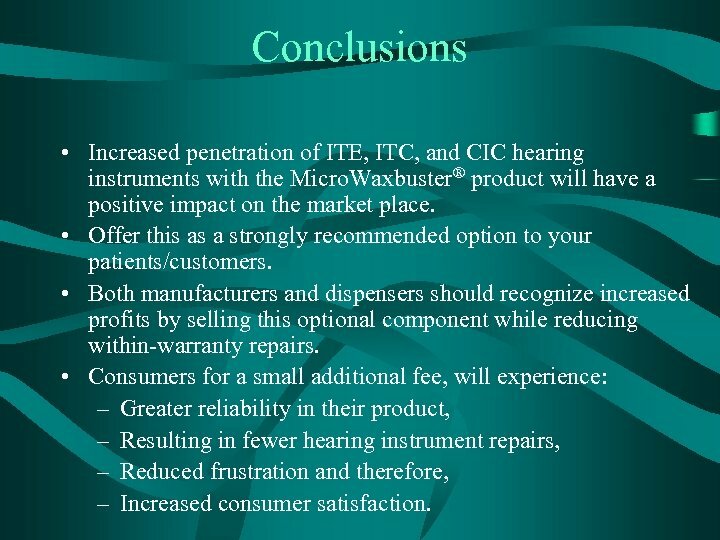 Conclusions • Increased penetration of ITE, ITC, and CIC hearing instruments with the Micro. 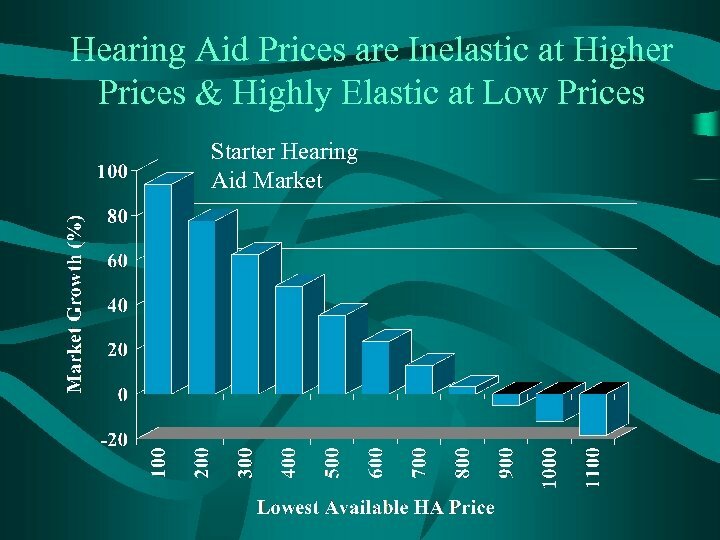 Waxbuster® product will have a positive impact on the market place. 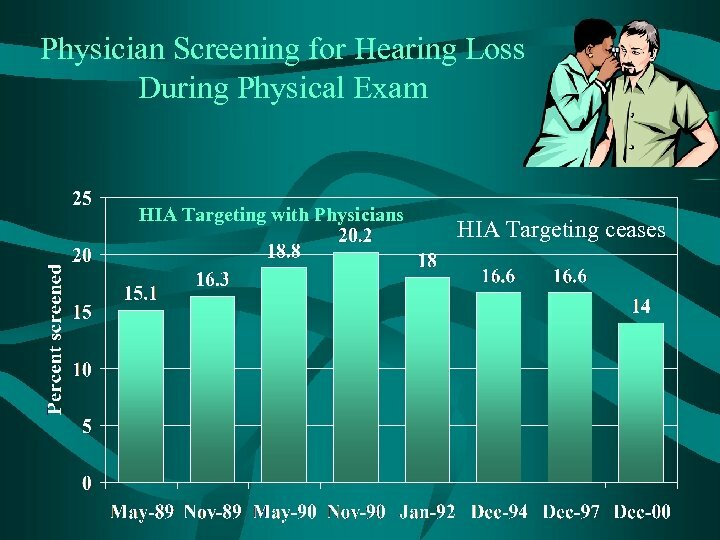 • Offer this as a strongly recommended option to your patients/customers. 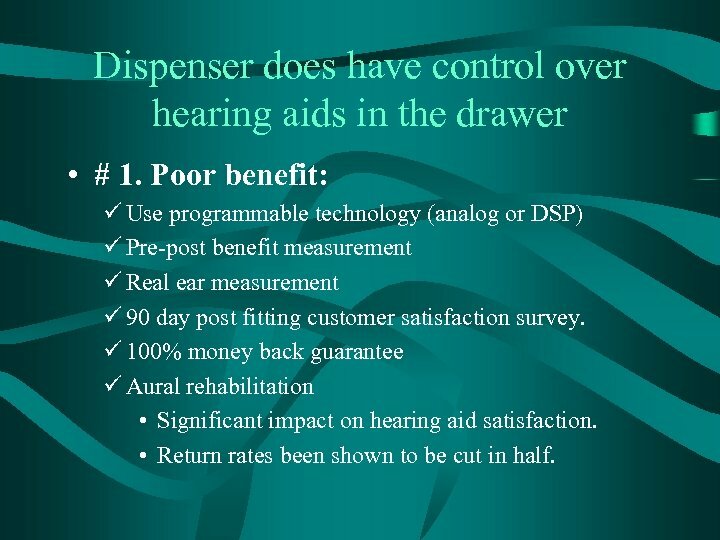 • Both manufacturers and dispensers should recognize increased profits by selling this optional component while reducing within-warranty repairs. 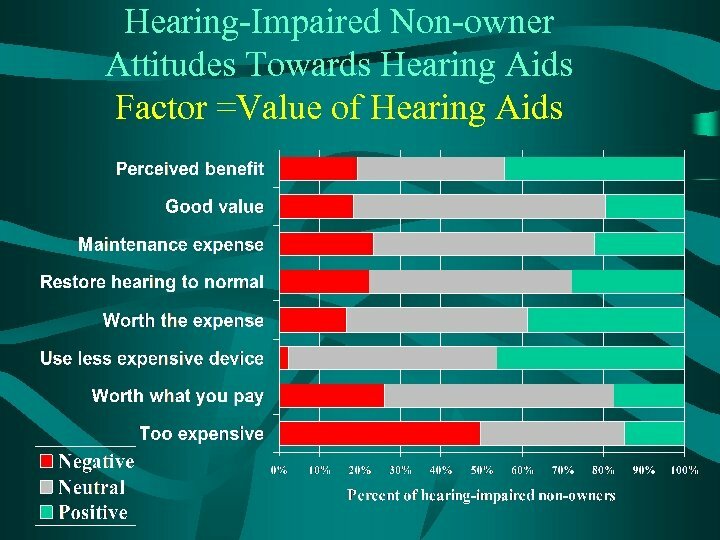 • Consumers for a small additional fee, will experience: – Greater reliability in their product, – Resulting in fewer hearing instrument repairs, – Reduced frustration and therefore, – Increased consumer satisfaction. 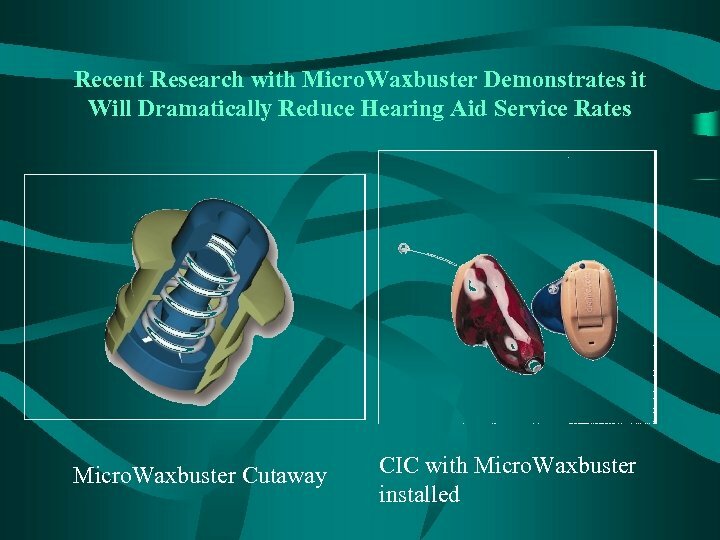 Significant Differences Product Features Factor Fit/comfort Ease VC adjust. 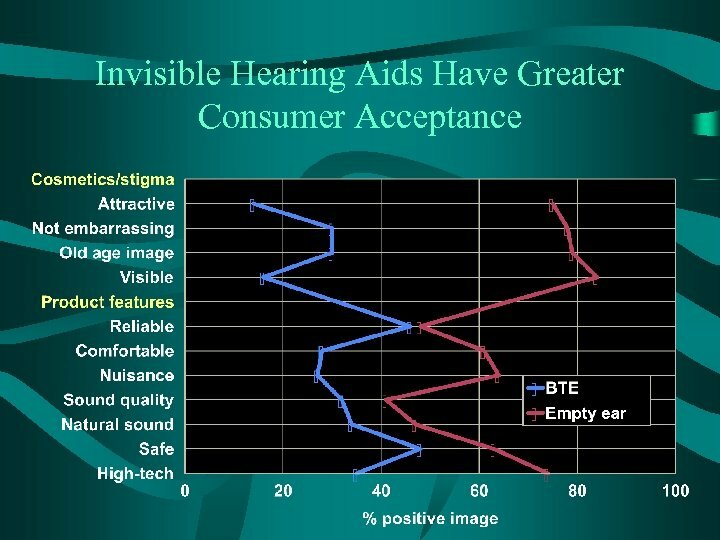 Visibility Packaging Freq. 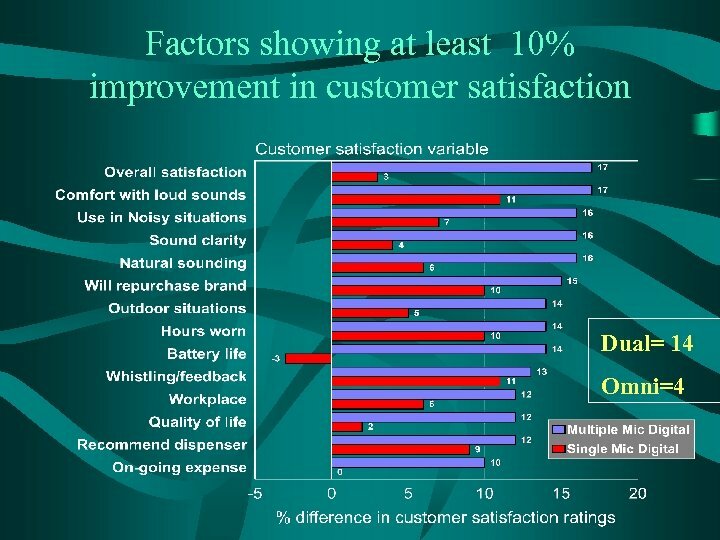 Cleaning Warranty Ease Battery Chg. On-going expense Single Mic & Marke. 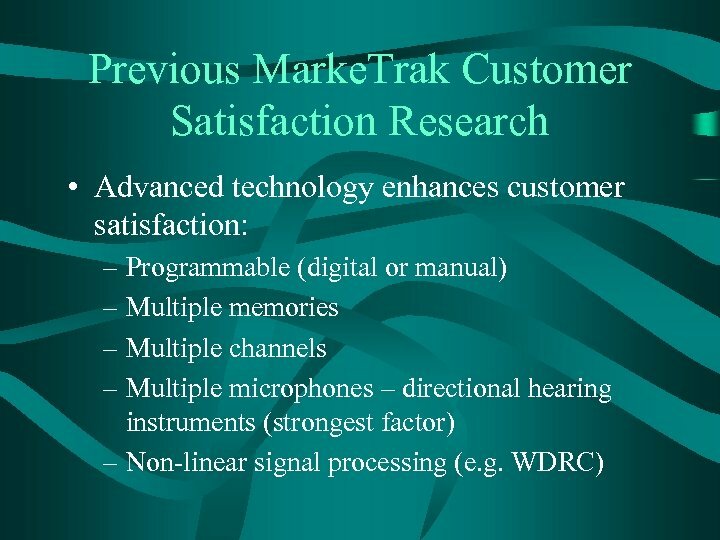 Trak Multiple Mic & Marke. 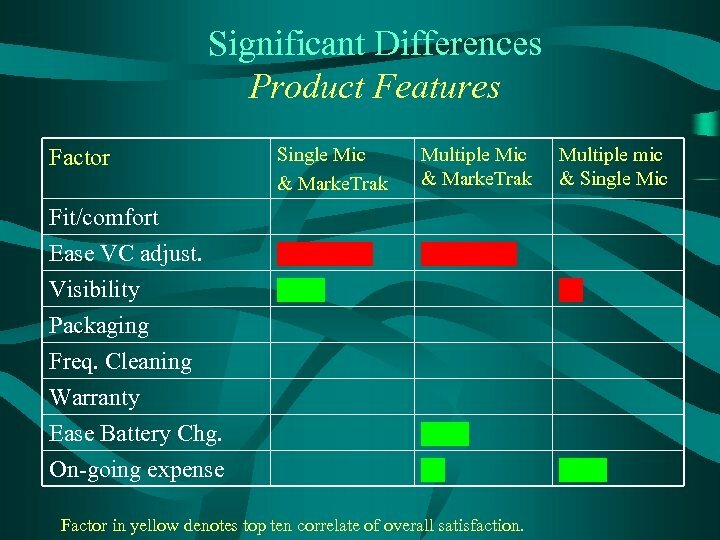 Trak Multiple mic & Single Mic Factor in yellow denotes top ten correlate of overall satisfaction. 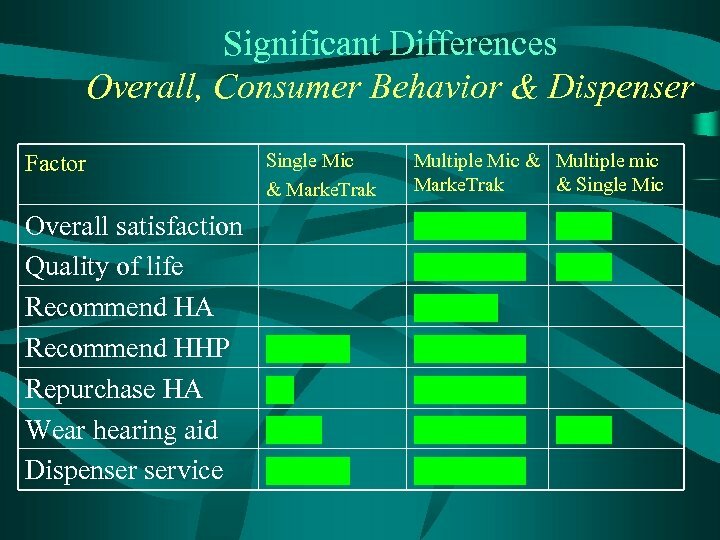 Significant Differences Performance Factors Multiple Mic & Marke. 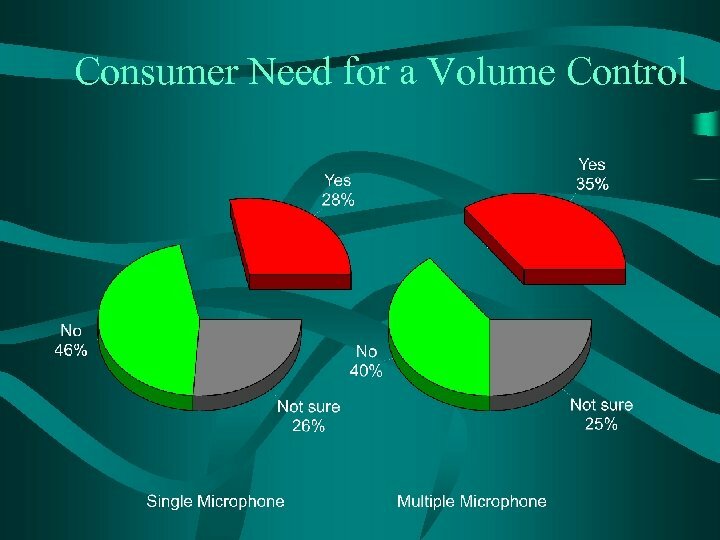 Trak Multiple mic & Single Mic Benefit Reliability Sound clarity Natural sounding Sound of voice Soft sounds Loud sounds Whistling/feedback Factor Single Mic & Marke. 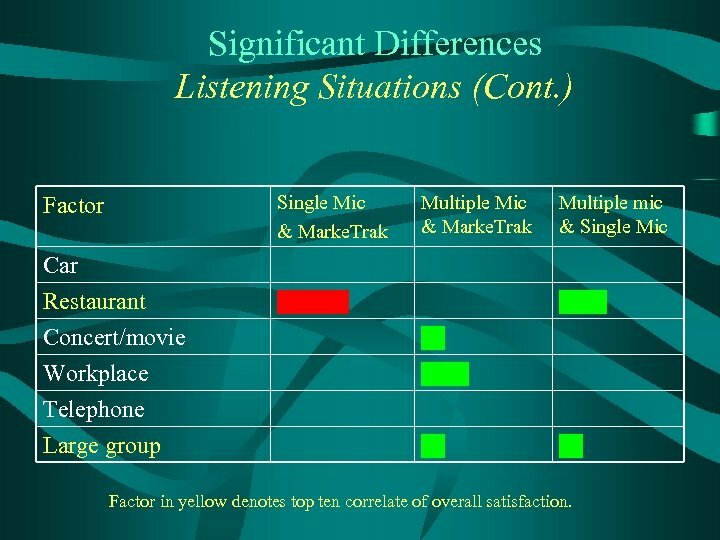 Trak Factor in yellow denotes top ten correlate of overall satisfaction. 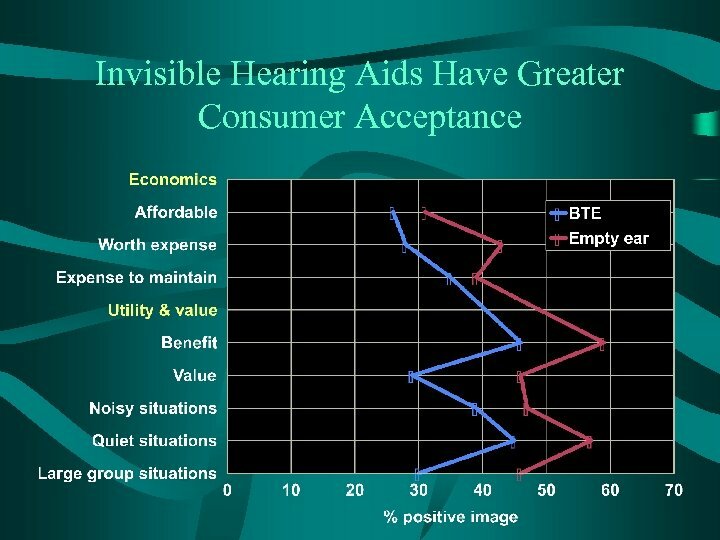 Significant Differences Performance Factors (Cont. ) 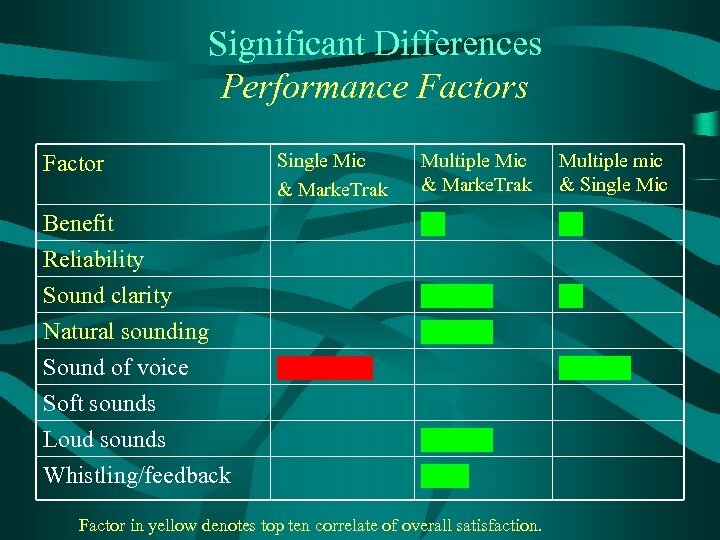 Factor Single Mic & Marke. 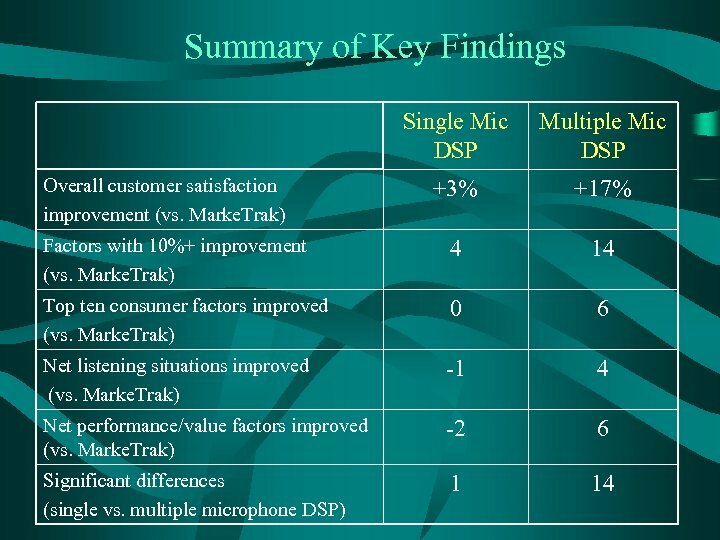 Trak Multiple Mic & Marke. 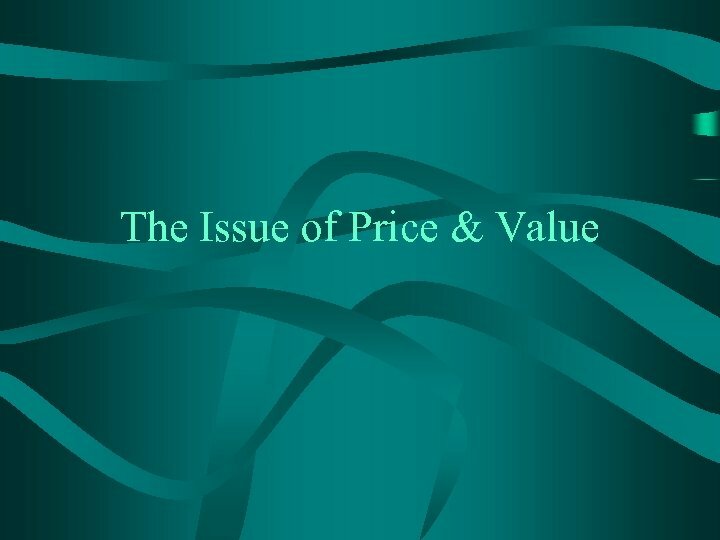 Trak Value (price/perf. ) 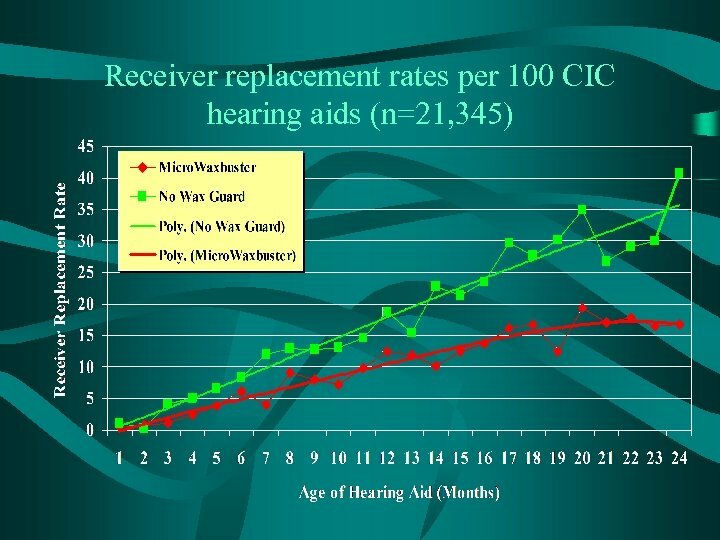 Directionality Multiple mic & Single Mic Use in Noisy Sit. 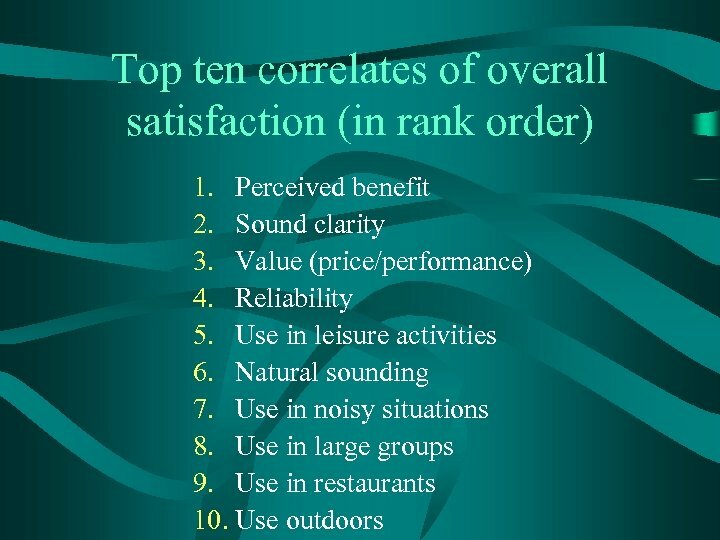 Battery Life Factor in yellow denotes top ten correlate of overall satisfaction. 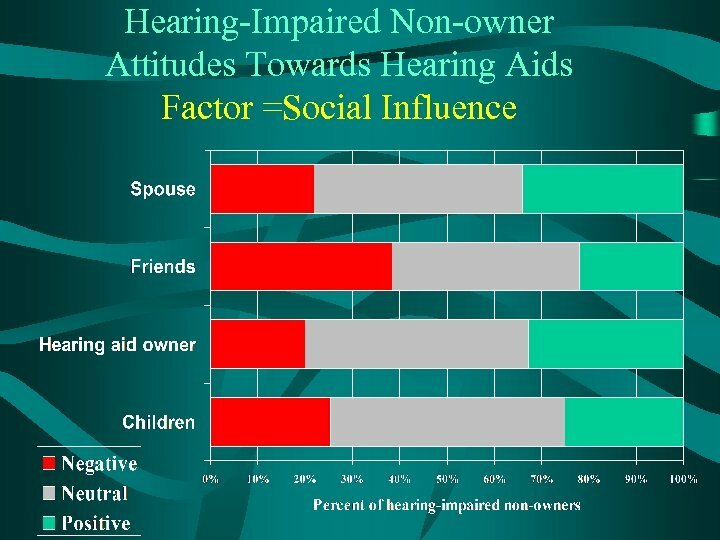 Significant Differences Listening Situations Factor Single Mic & Marke. 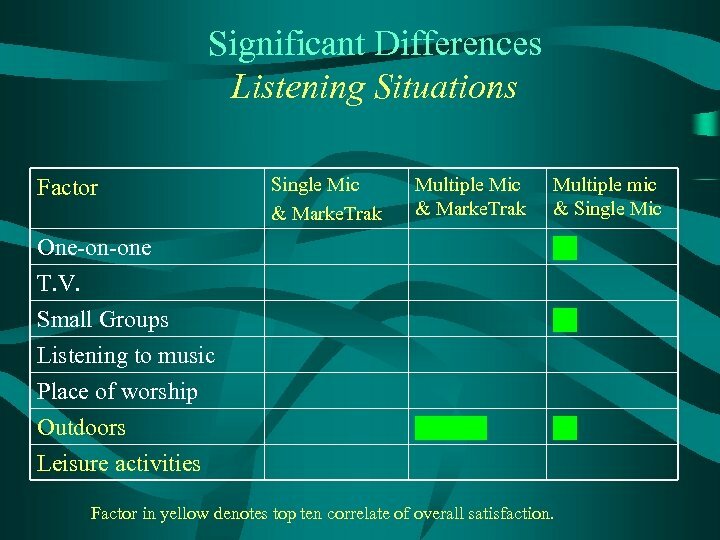 Trak Multiple mic & Single Mic One-on-one T. V. Small Groups Listening to music Place of worship Outdoors Leisure activities Factor in yellow denotes top ten correlate of overall satisfaction. 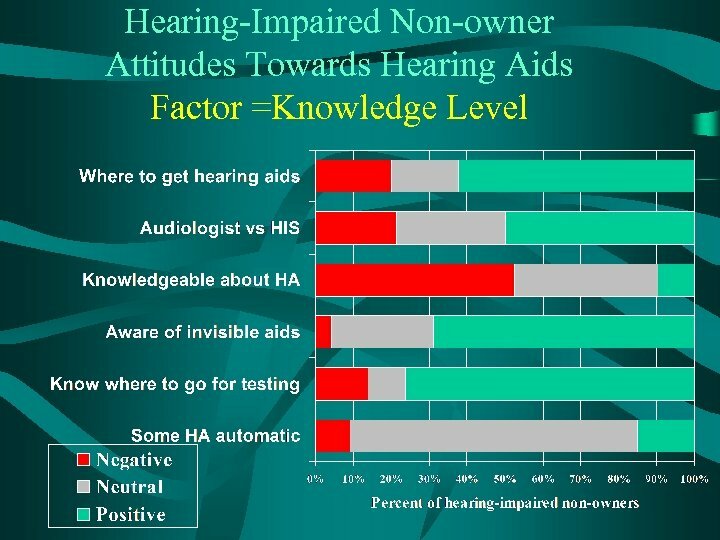 Significant Differences Listening Situations (Cont. ) Single Mic & Marke. Trak Factor Car Restaurant Concert/movie Workplace Telephone Large group Multiple Mic & Marke. 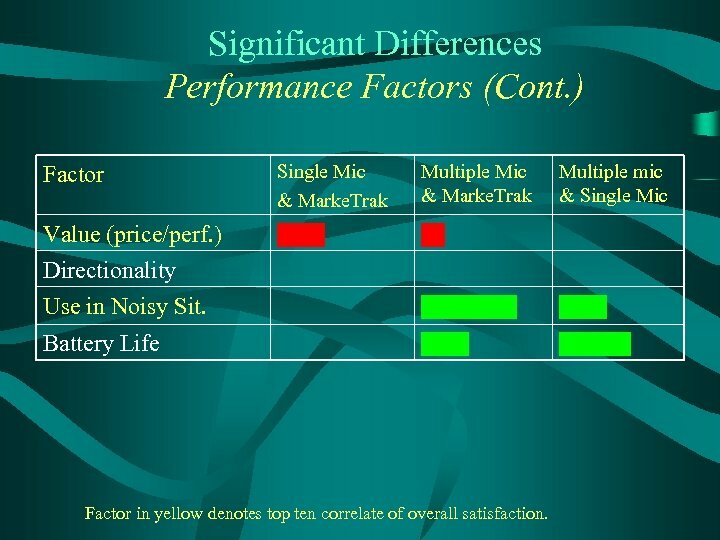 Trak Multiple mic & Single Mic Factor in yellow denotes top ten correlate of overall satisfaction. 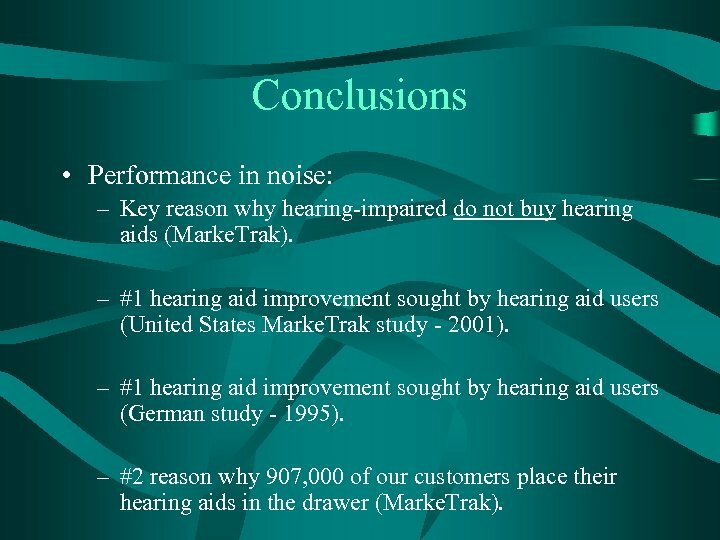 Conclusions • Performance in noise: – Key reason why hearing-impaired do not buy hearing aids (Marke. 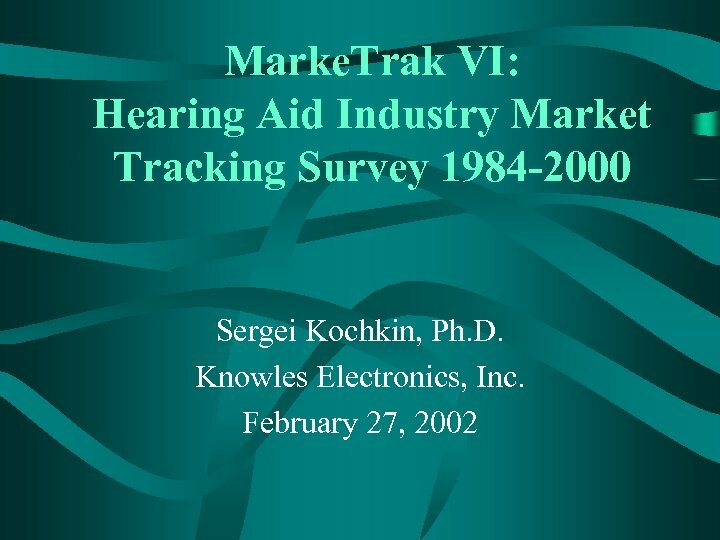 Trak). 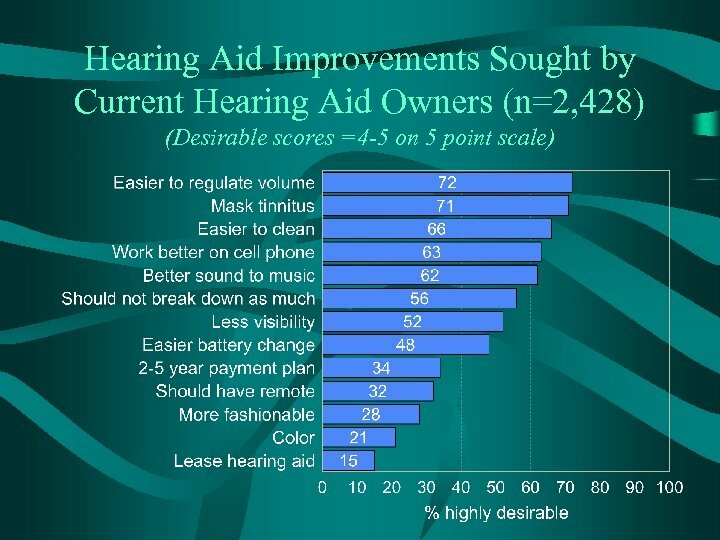 – #1 hearing aid improvement sought by hearing aid users (United States Marke. 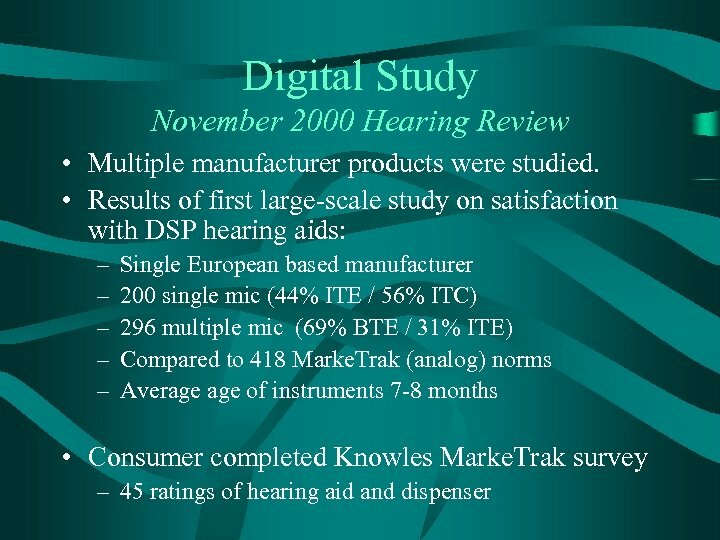 Trak study - 2001). 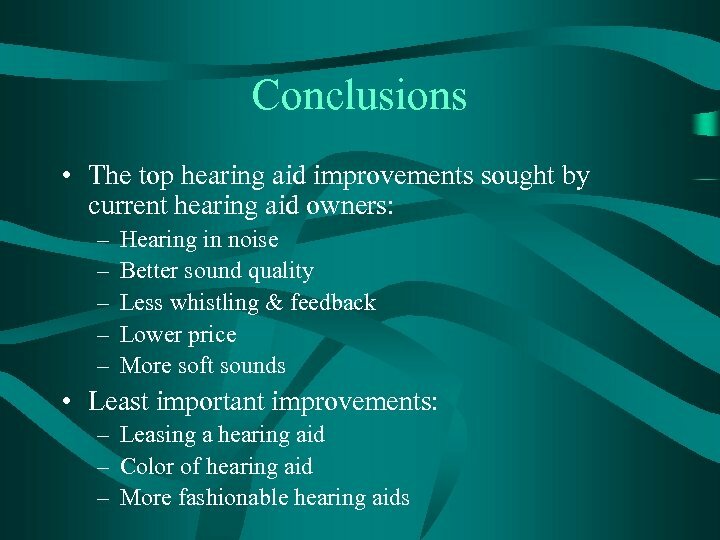 – #1 hearing aid improvement sought by hearing aid users (German study - 1995). 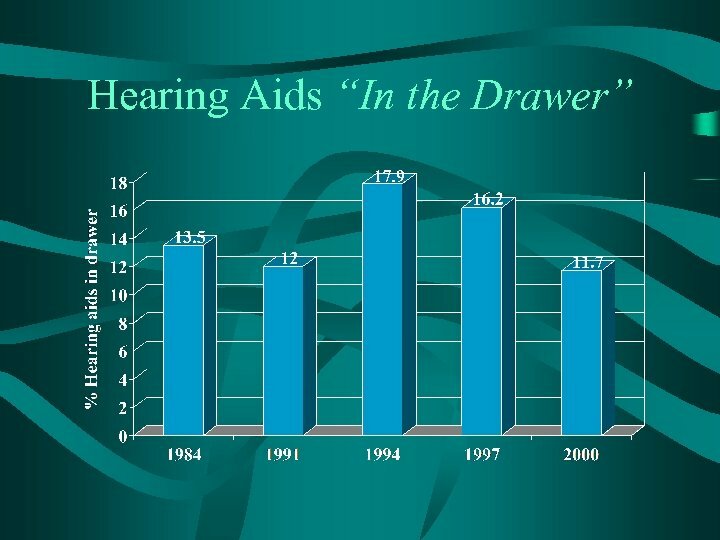 – #2 reason why 907, 000 of our customers place their hearing aids in the drawer (Marke. Trak). 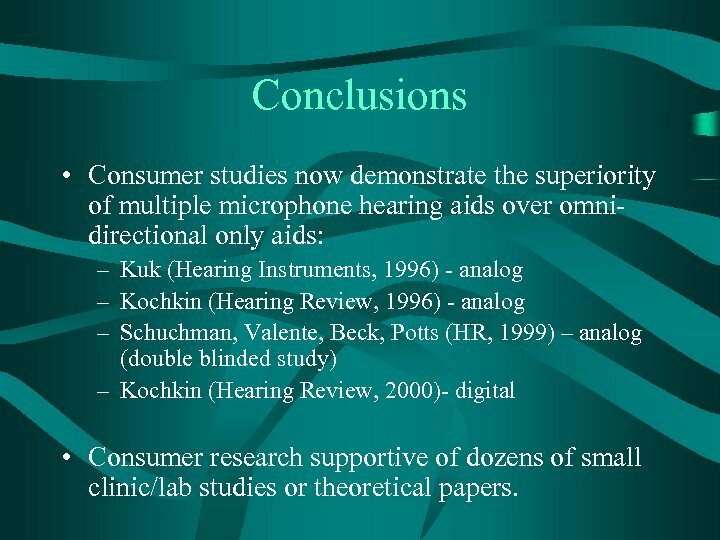 Conclusions • Consumer studies now demonstrate the superiority of multiple microphone hearing aids over omnidirectional only aids: – Kuk (Hearing Instruments, 1996) - analog – Kochkin (Hearing Review, 1996) - analog – Schuchman, Valente, Beck, Potts (HR, 1999) – analog (double blinded study) – Kochkin (Hearing Review, 2000)- digital • Consumer research supportive of dozens of small clinic/lab studies or theoretical papers. 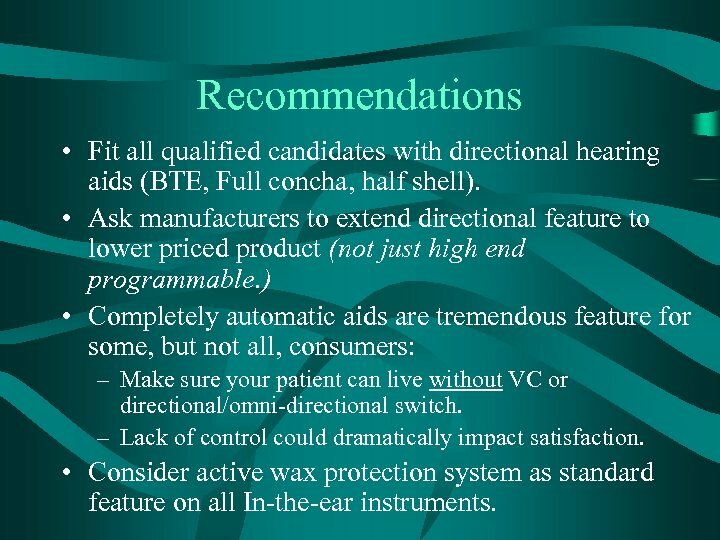 Recommendations • Fit all qualified candidates with directional hearing aids (BTE, Full concha, half shell). 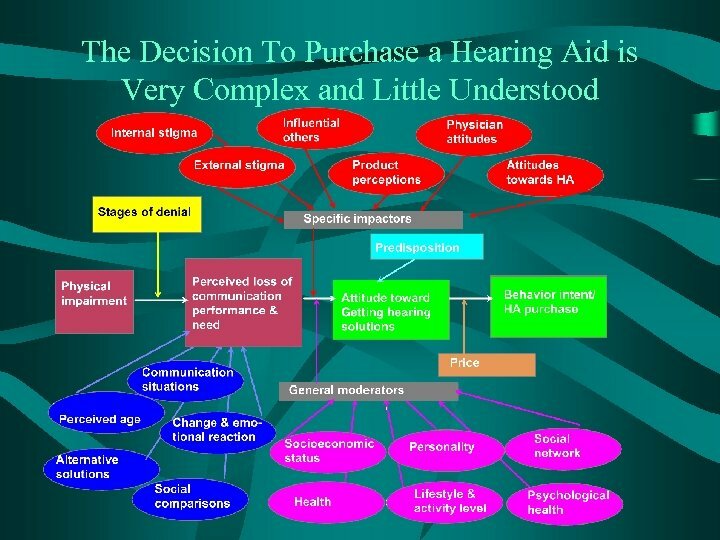 • Ask manufacturers to extend directional feature to lower priced product (not just high end programmable. ) 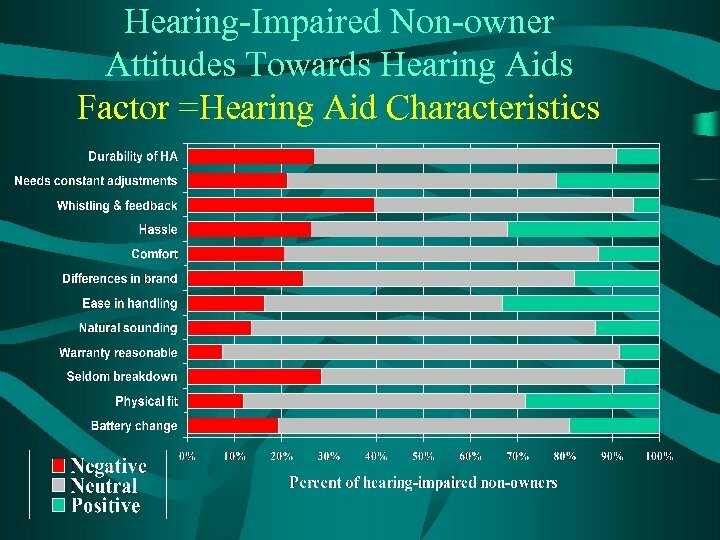 • Completely automatic aids are tremendous feature for some, but not all, consumers: – Make sure your patient can live without VC or directional/omni-directional switch. 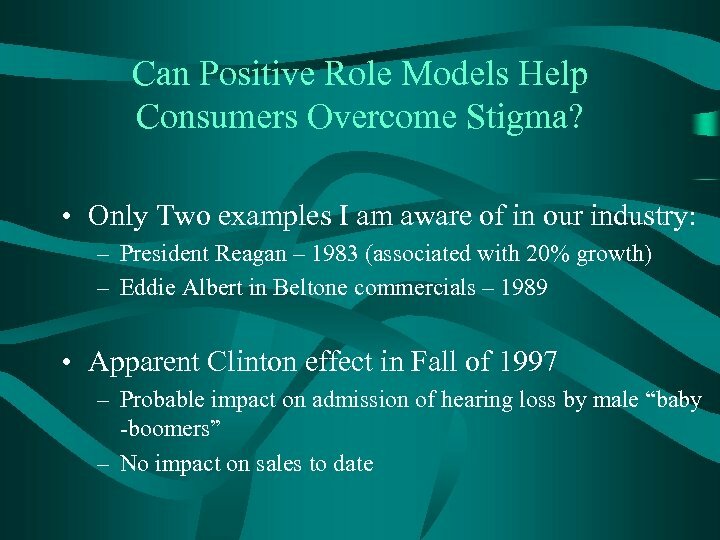 – Lack of control could dramatically impact satisfaction. 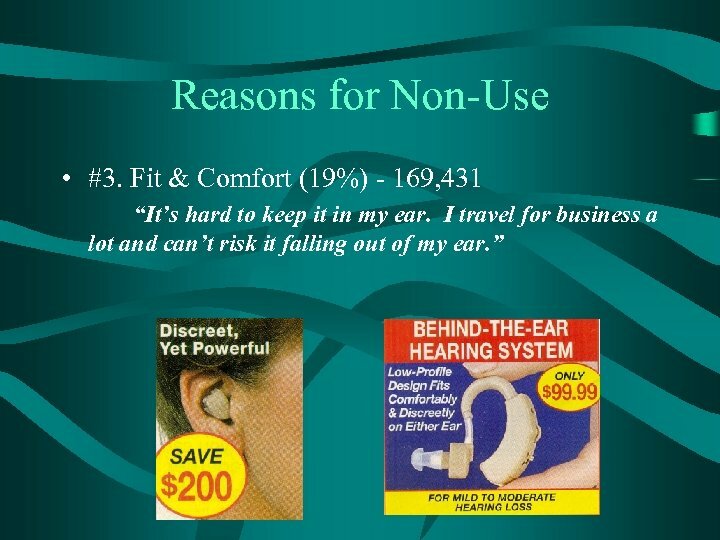 • Consider active wax protection system as standard feature on all In-the-ear instruments.